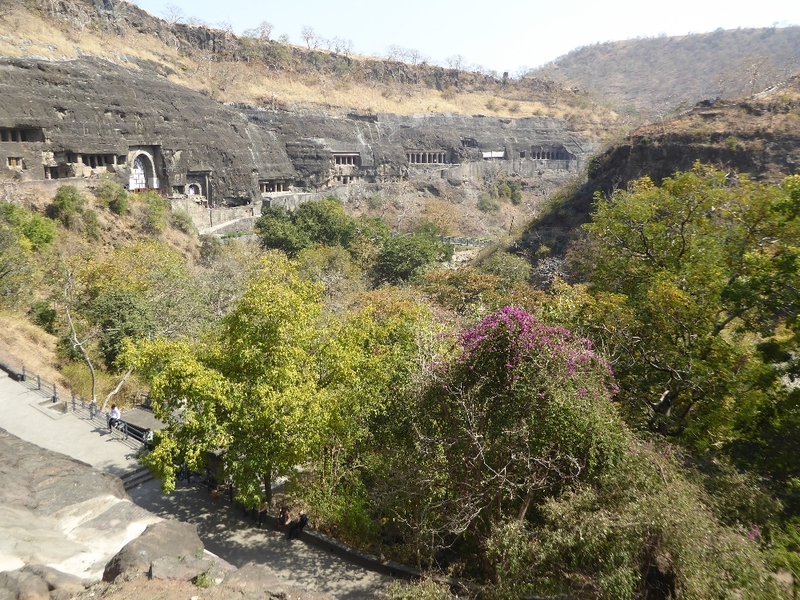 The thirty or so Ajanta caves, 200 miles northeast of Mumbai, are a top tourist destination in India. Is that good news or bad? Here, through herculean effort, is a presentation hiding the crowds, save one image included for verisimilitude. 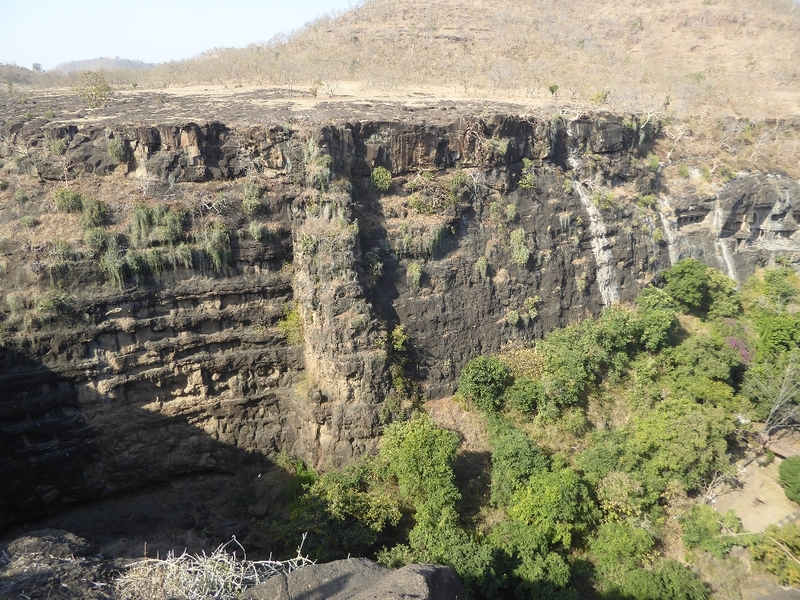 The sinuous Waghora or "tiger" river, threads its course through old basalt flows about 200 miles northeast of Mumbai. 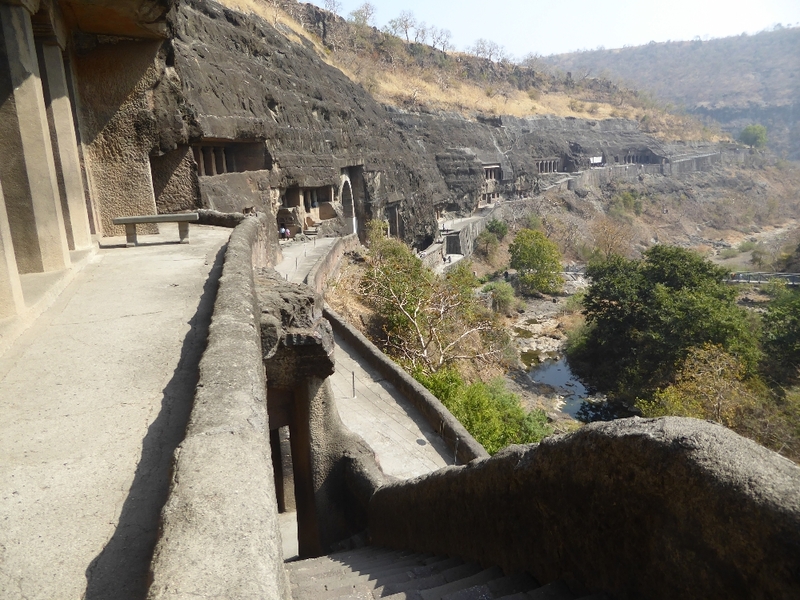 The caves at Ajanta (from a Sanskrit word meaning "impregnable pass") line the outside of one of the river's curves at a spot where the basalt forms a cliff about 250 feet high. Most visitors arrive on shuttle buses unloading at the lower right corner. There's a much bigger parking lot to the right, out of sight and a few miles downstream. You park your vehicle there, run a gauntlet of craft vendors, then board a shuttle. When you get off the shuttle, youse buys yer ticket and walks up some stairs or the zigzag path visible here. Alternatively, you can be carried in a dholi or sedan chair by four hearties. 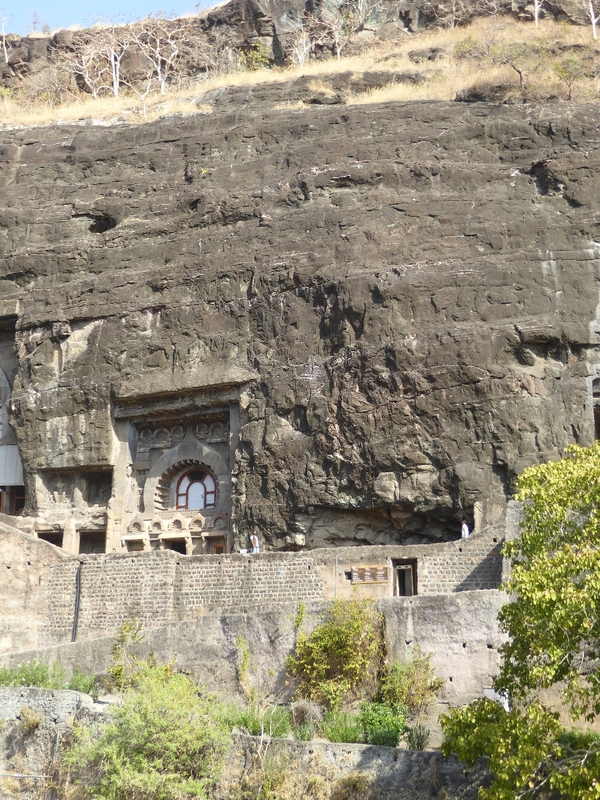 There's a small recent building at the top, then a level concrete path that widens where the cliff begins. That's the location of Cave 1. You can walk or be carried all the way over to Cave 26 at the far left (two further caves are off limits). 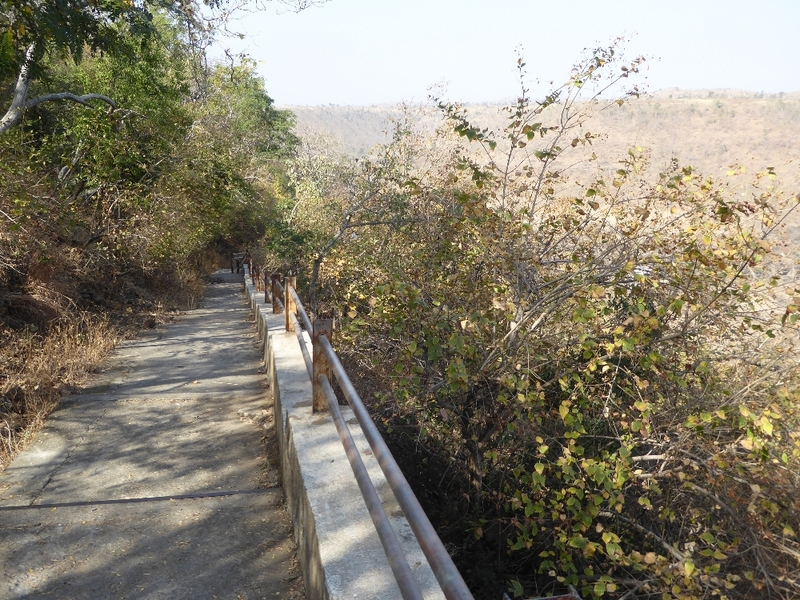 Alternatively, as the shadow at the lower left suggests, you can start at the top of the opposite wall of the canyon and walk down past by a conical-roofed kiosk at the tip of the point. You then cross the steel bridge seen here, and land close to Cave 9. The cave numbers were settled by about 1880 and are used in several publications from that period. 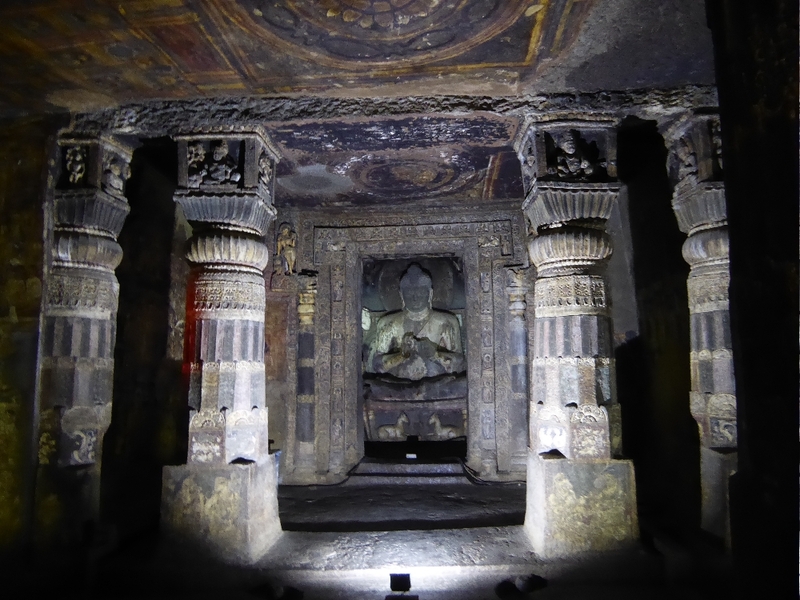 See the Archaeological Survey of Western India's Notes on the Bauddha Rock-Temples of Ajanta, written by James Burgess and published in 1879. Much of this material was recapitulated in The Cave Temples of India, published in 1880 by James Fergusson and Burgess. See also the supplemental Report on the Buddhist Cave Temples and their Inscriptions, published by Burgess in 1883. This third publication includes, as Platc XIV, a map or plan of the caves, with their numbering. 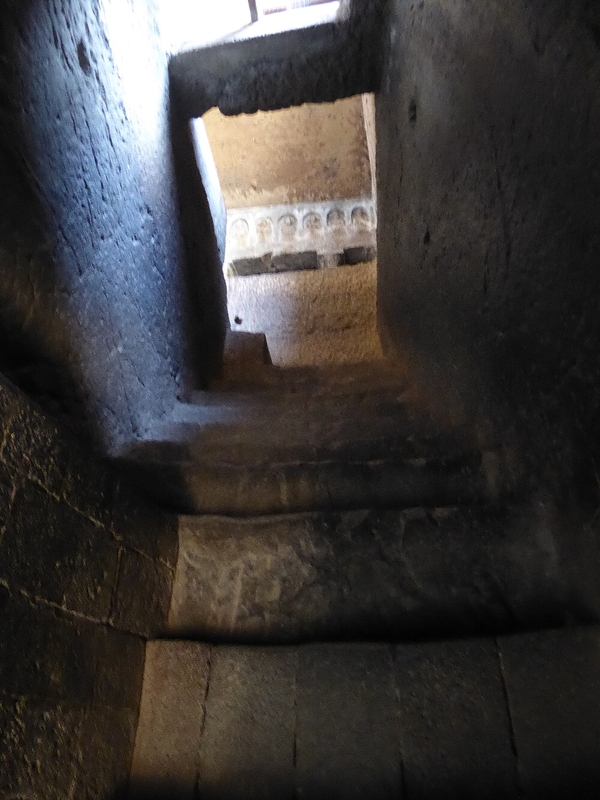 The numbers have nothing to do with the chronology of the caves, which begins at or close to Cave 10. One more thing: this is January. Come in July and the countryside would be much greener. Good thing we're going downhill. 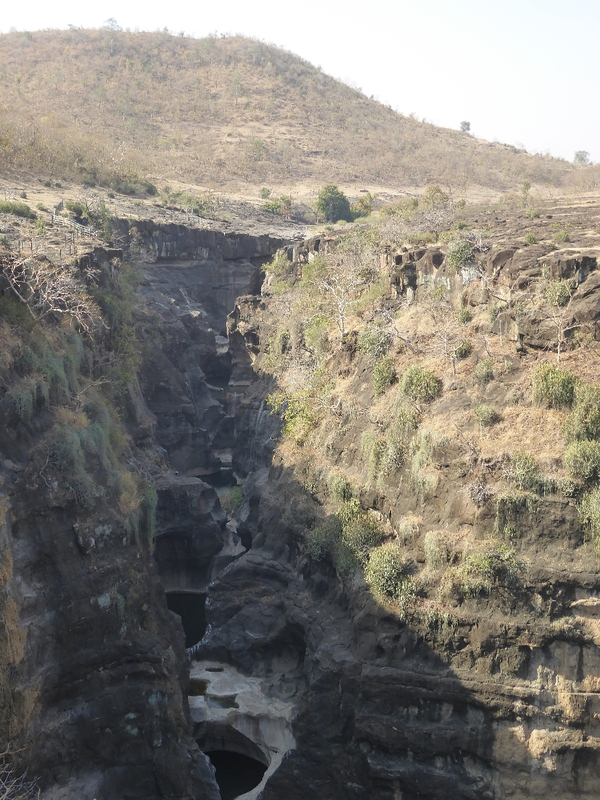 Just upstream from the caves, the Waghora has a series of small falls called the sat kund or "seven leaps." The ancients could hardly not have noticed the weathering of the lava flows on both sides of the canyon. Perhaps it gave them an idea. A dozen or more lava flows are stacked up. 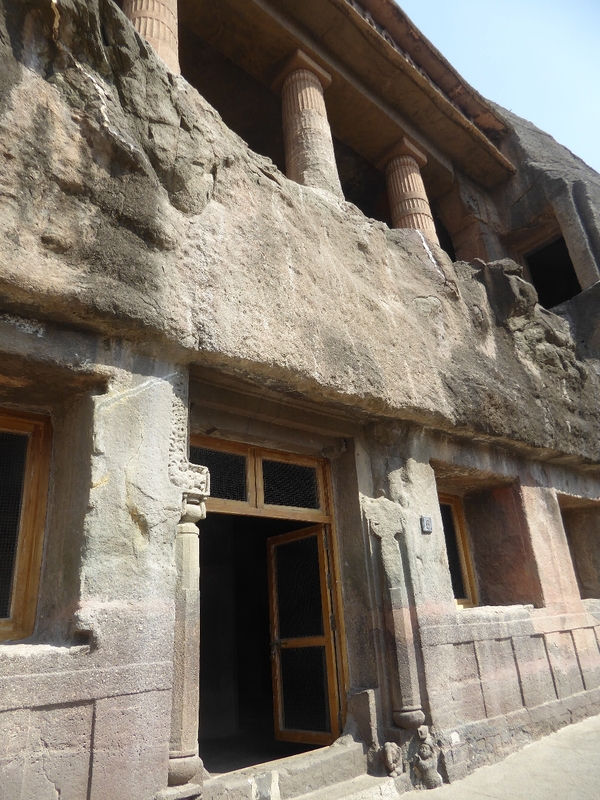 At the far right you can make out Caves 28, 27, and the taller 26, with an arched window over the entrance. The view here extends downstream as far as Cave 21. 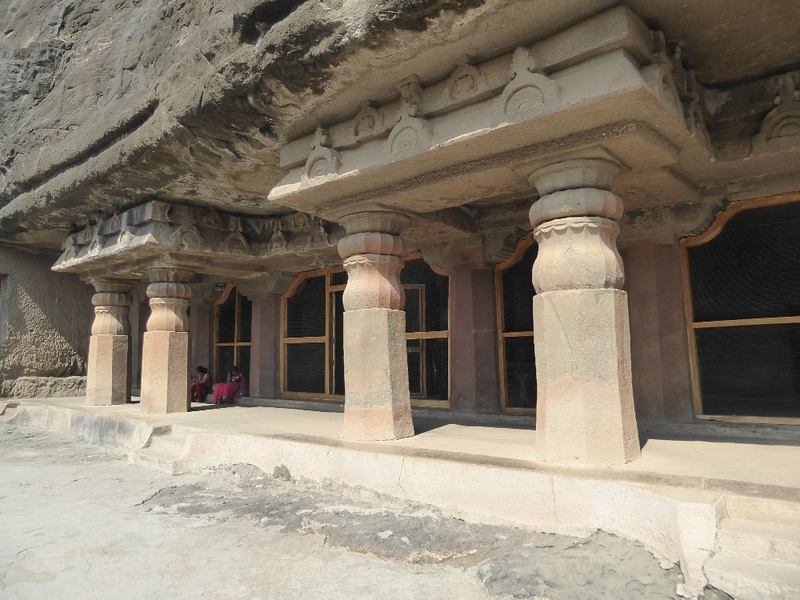 The arched window of Cave 26 indicates a prayer hall or chaitya). 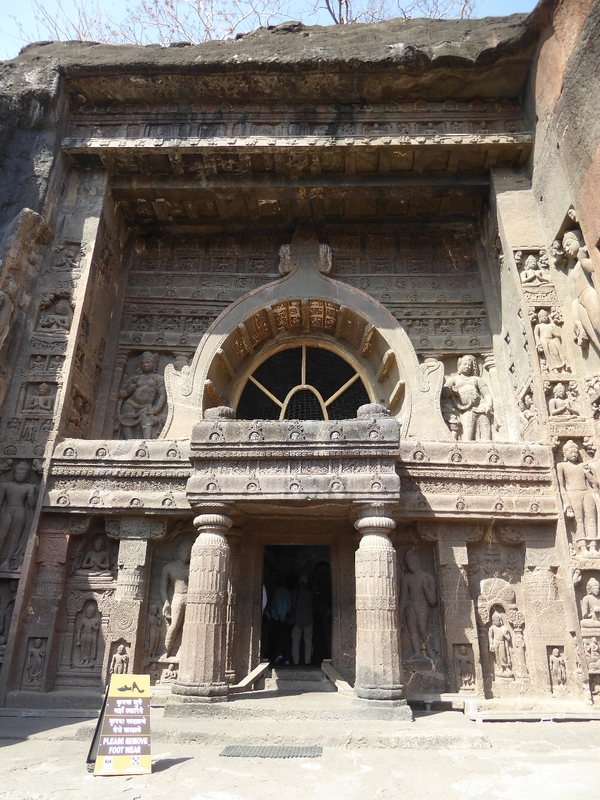 Flat entrances indicate monasteries or viharas. 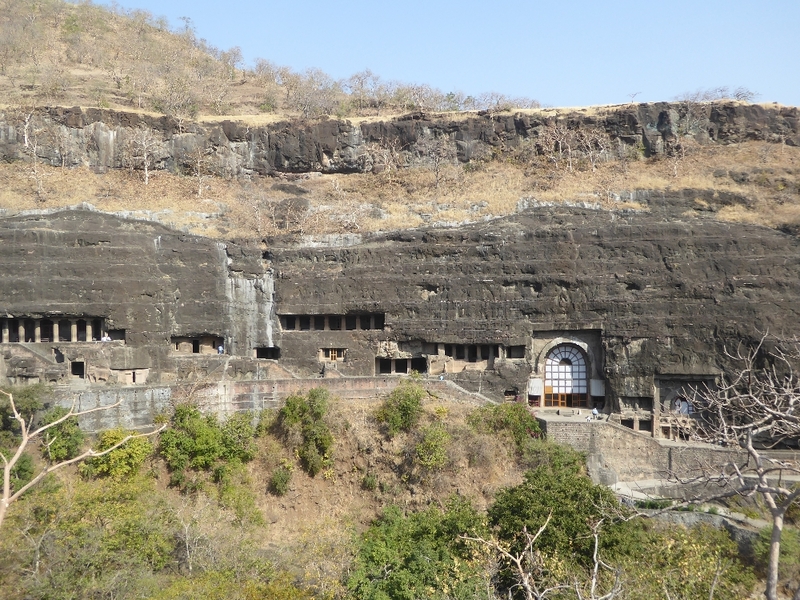 Ajanta has four chaityas (five, at a pinch); the rest of the caves are viharas. From the viewpoint at the end of the ridge, there's a good view from Cave 28 on the left to 17, where a white screen offers some protection to the cave-wall paintings. 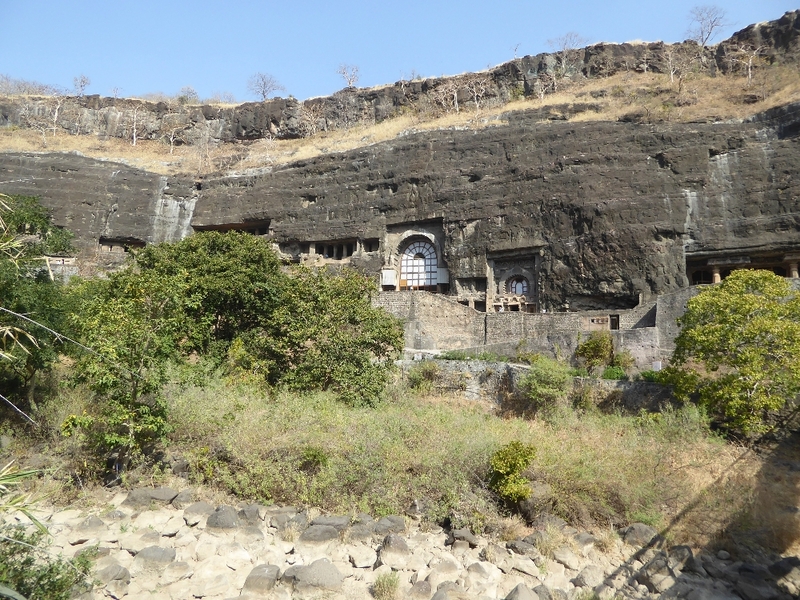 You can see the arched window of Cave 19, too, which contends with Cave 26 for the title of most elaborate or decorated chaitya. 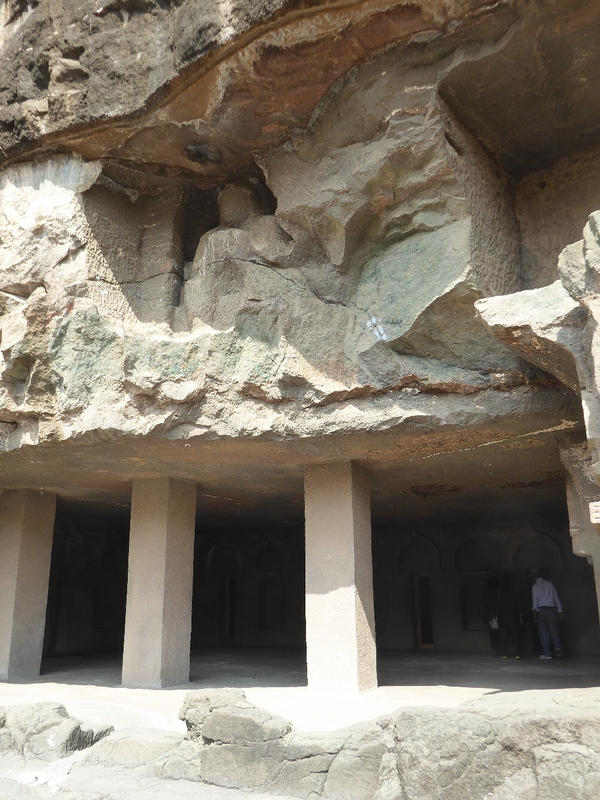 Above the other caves and just left of the vertical water stain, there's an unfinished chaitya numbered as Cave 29 and off the visitor's route. 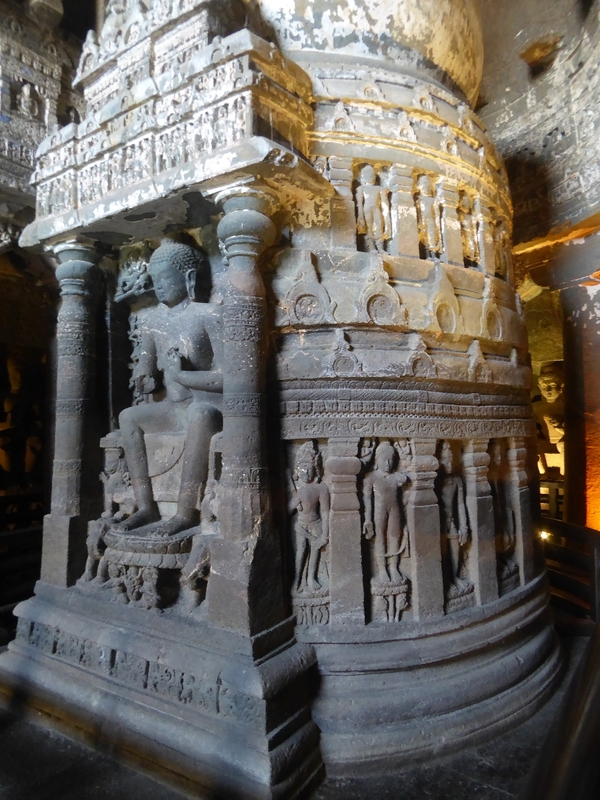 That's the "at a pinch" fifth chaitya. 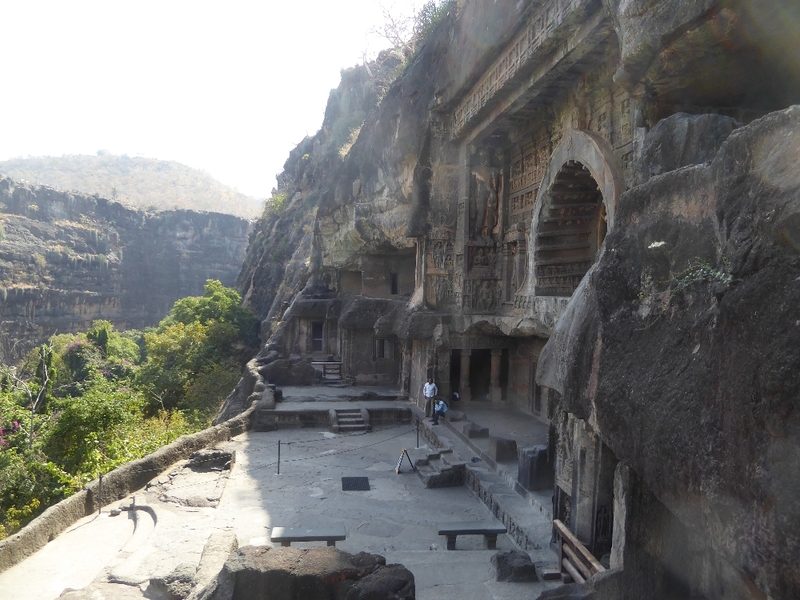 Here's a decent view of Caves 1 and 2. (Two has a protective shade, here dimmed by natural shade.) 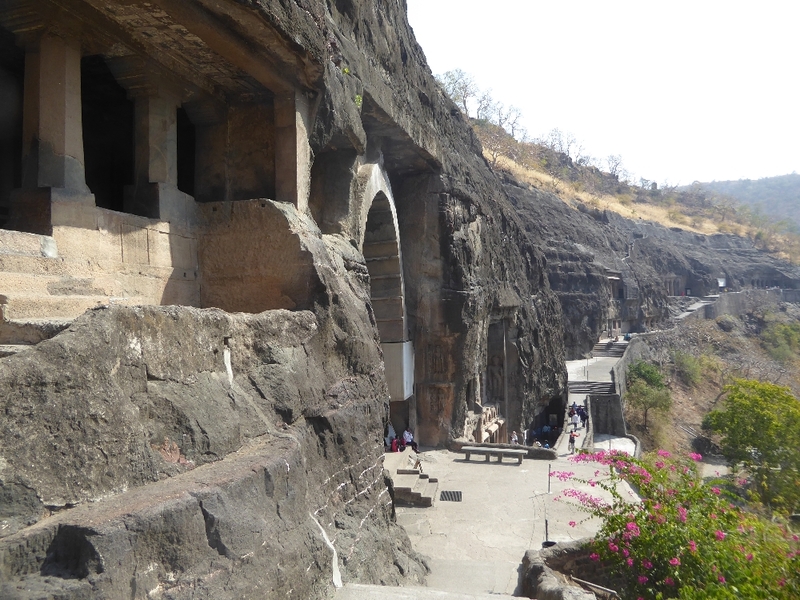 You can also see the two oldest chaityas, Cave 9 and 10, which are just above the bridge. 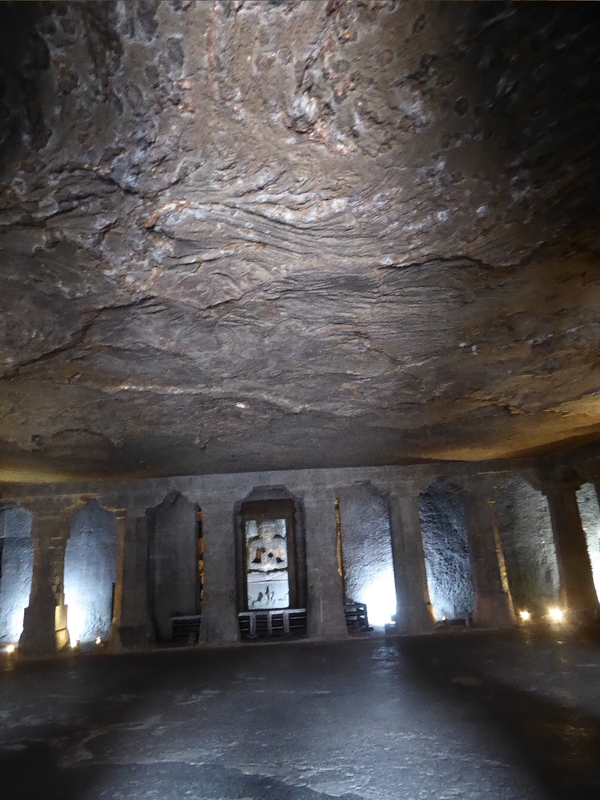 Nine is hard to see, but Cave 10 is clear from its white translucent panels, handy to exclude bees and bats. 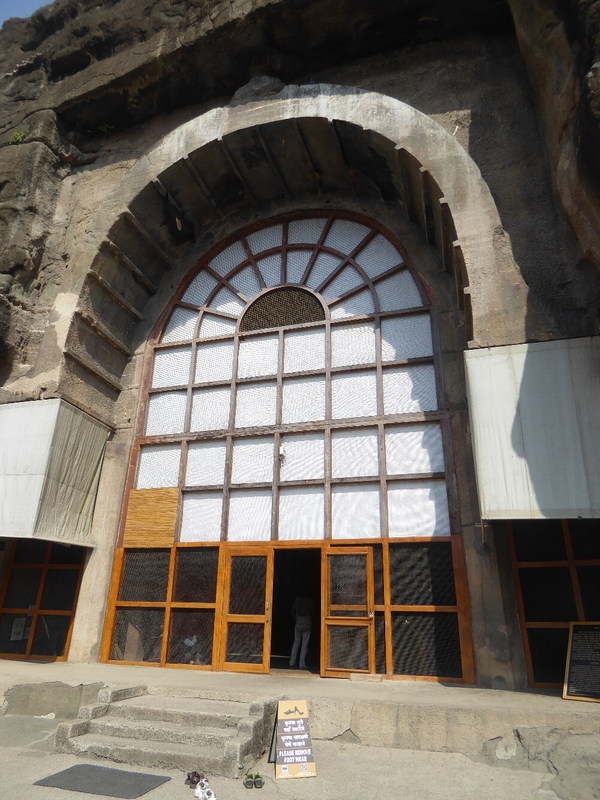 You can also see the shades protecting Cave 17 and the arched window of Cave 19. See three chaityas, Jane. See them run from left to right: Caves 19, 10 (with its white shades), and 9, half in natural shade. Yes, unfinished 29 is at the upper left. Cave 9 is partly visible behind the branches, while Cave 10 insists on attention. Over at the far left is 16, a key vihara, which set the standard for many to follow. 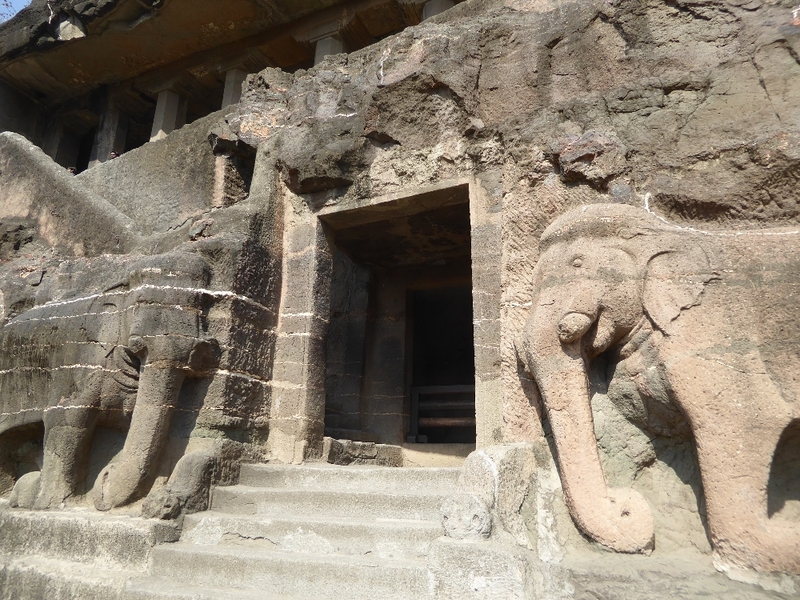 The entrance to 16 is through the door below it, framed by elephants. 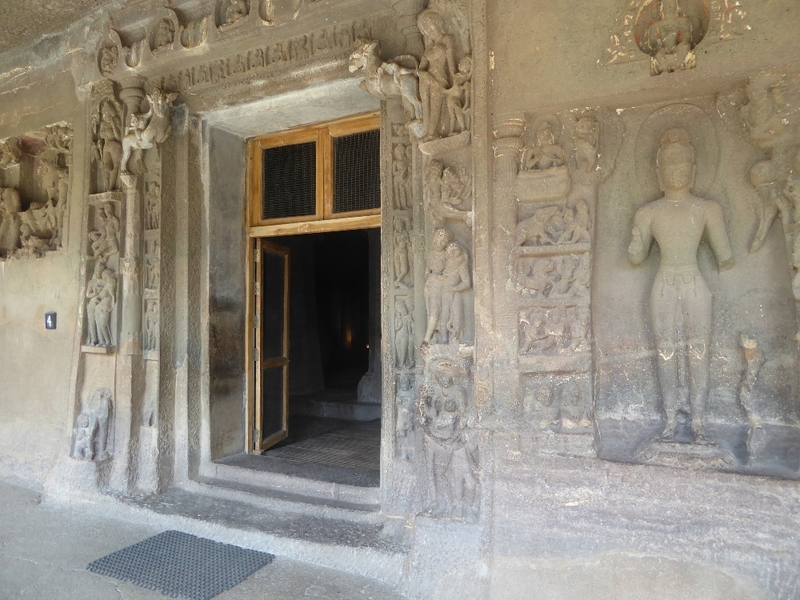 This was the ancient entrance to the site, although it's not clear how monks seeking shelter during the monsoon got to it. Did they find a way up the flooding Waghora? You're getting the hang of it: from the right there's Cave 16, shaded 17, arched 19, and 29 at the higher level. A modern bridge crosses the stained channel of a seasonal cascade. Did I mention that this is the dry season? That's Cave 9, and the door in the wall below it leads to the ticket office for people coming down the canyon wall as we have. 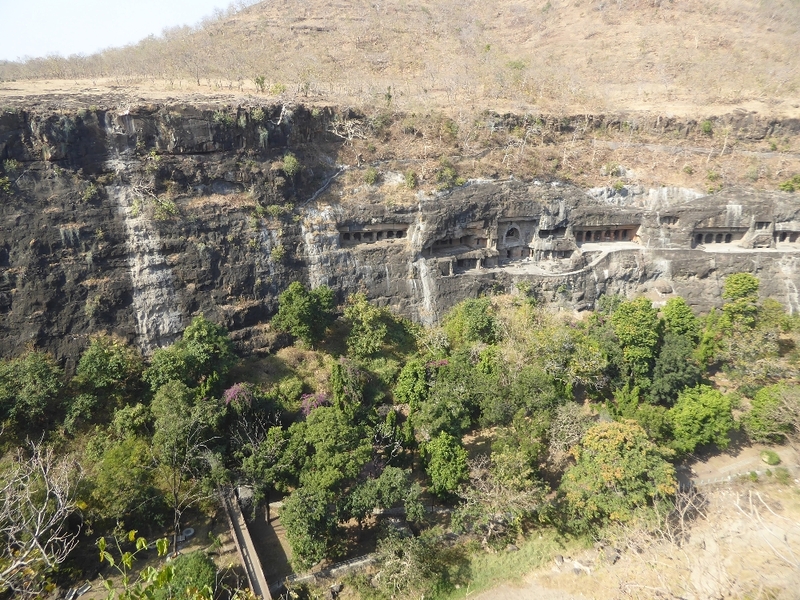 The stone-block wall here probably dates from the 1930s, when the Nizam of Hyderabad, whose domain included Ajanta, built a vehicular bridge in the same style. That bridge is used by the shuttle buses that bring most tourists to the site. 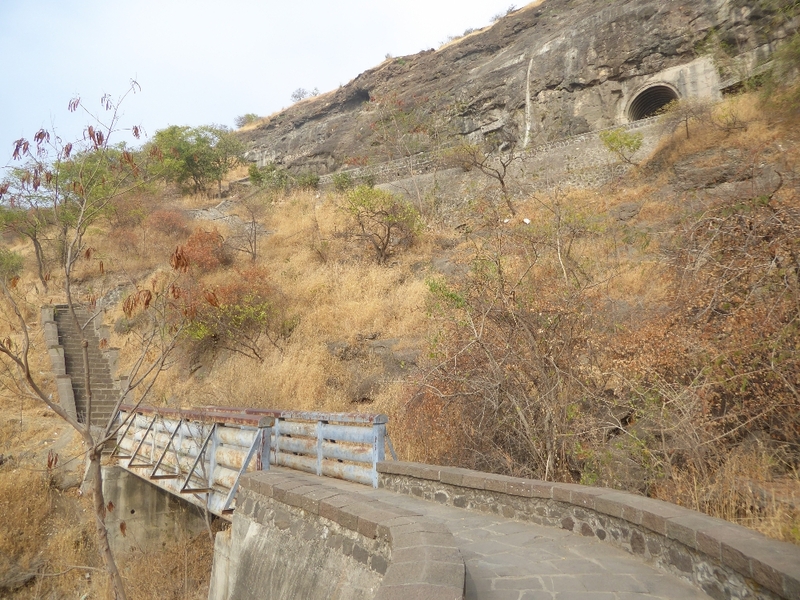 Back in the 19th century, access was tougher, and the caves themselves were hidden behind rubble and vegetation. 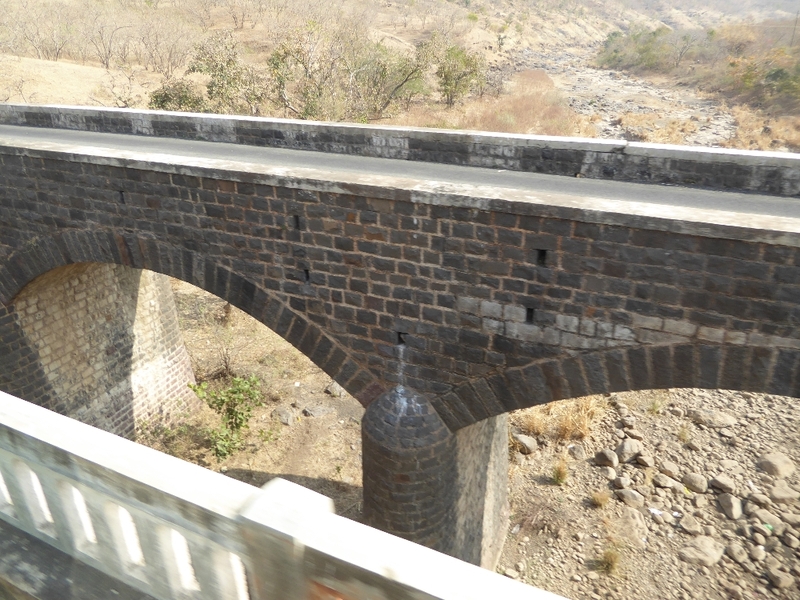 The pedestrian bridge across the Waghora. 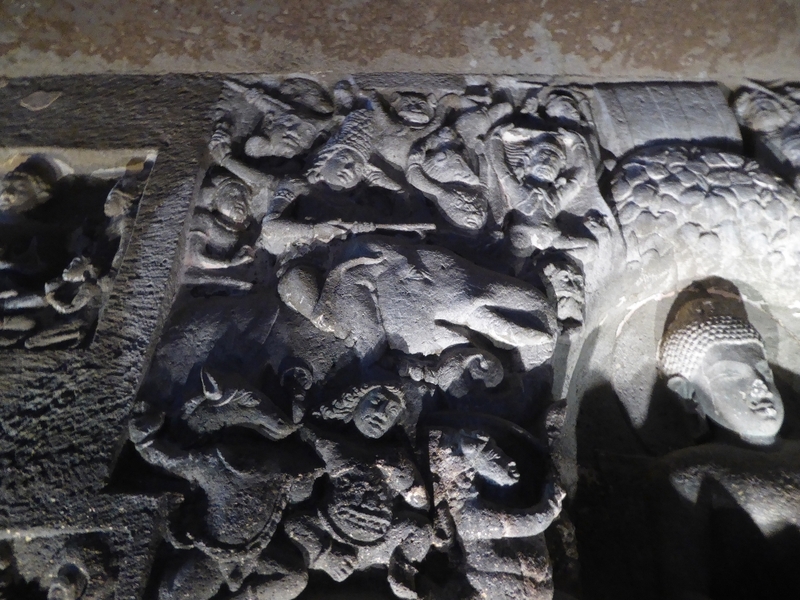 Step through the doorway between the elephants, and you bump into this life-sized image of Nagendra, the protective snake deity here functioning as a gatekeeper. 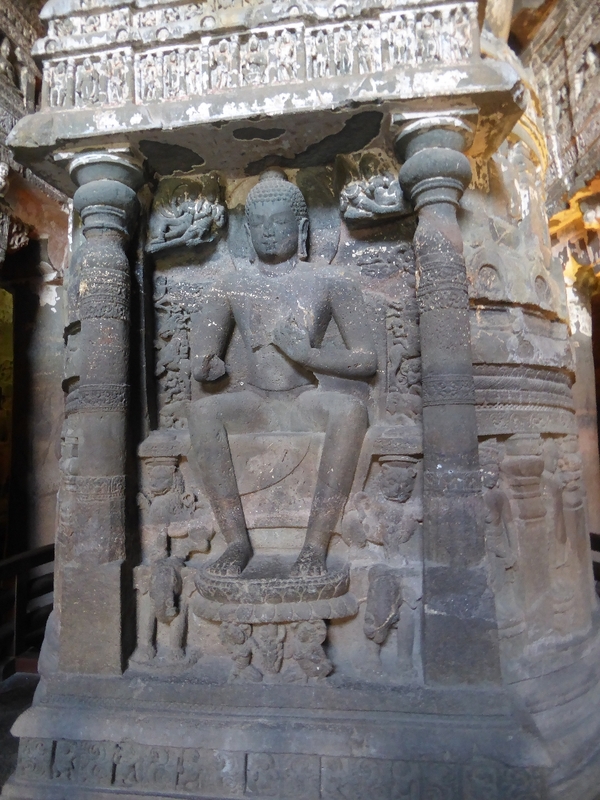 The figure was carved by order of Varahadeva, who remained in power at least from 462 to 478, a period embracing what Spink considers the entire second phase of construction. 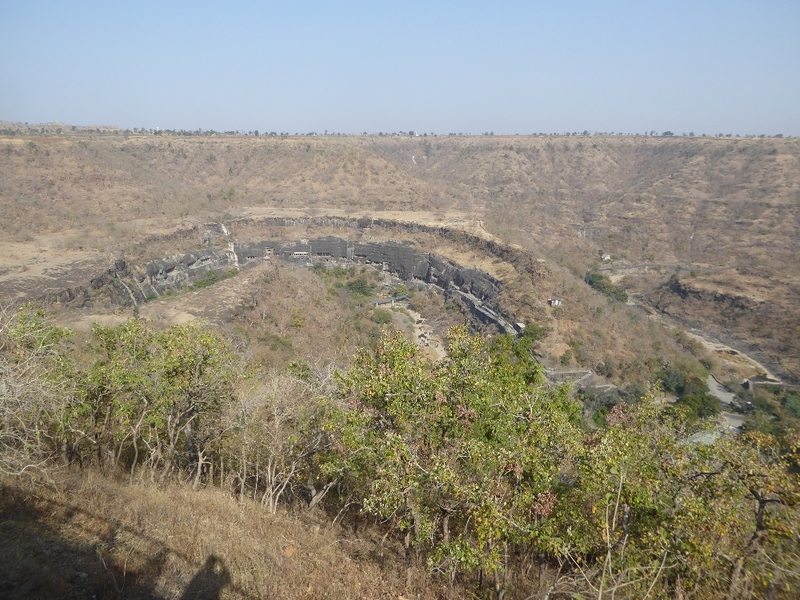 The Archaeological Survey of India is more expansive in its dating. The image was completely hidden by rubble and vegetation until unmasked by archaeological workers in the 19th century. What business Buddhists had with nagas is a nice question, but there's a lot of imagery on the site that is even more perplexing. And if you wonder how anyone can tell that this is a snake divinity, look around. Not only are there very contented snakes on either side, Nagendra is reclining against the coils of a particularly big 'un. We'll get back over to Cave 16, but for a moment I've slipped over to the gate just before Cave 1, so we can get a better sense of the modern path. Most people come this way, past the door behind us and then along this concrete highway over as far as Cave 26, where there's a guard itching to blow his whistle at miscreants who thought they might peek at 27 and 28. Good luck! Remember that stain we saw on the cliff many pictures back? In the wet season, we'd need this bridge. I think I see 19 up ahead. Or is it 26? Answer: it's 26. Cave 19 is behind us. 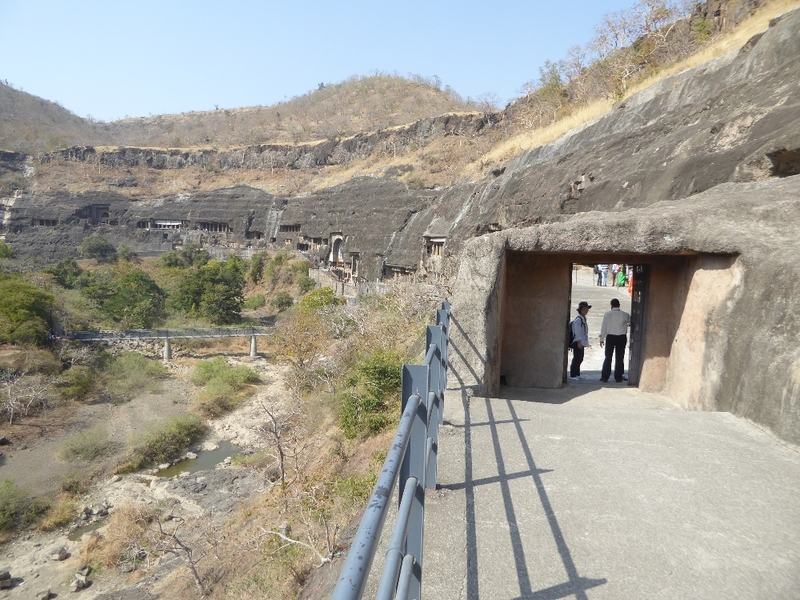 All the caves in view here, from 21 to 28, were excavated under a powerful monk by the name of Buddhabhadra. 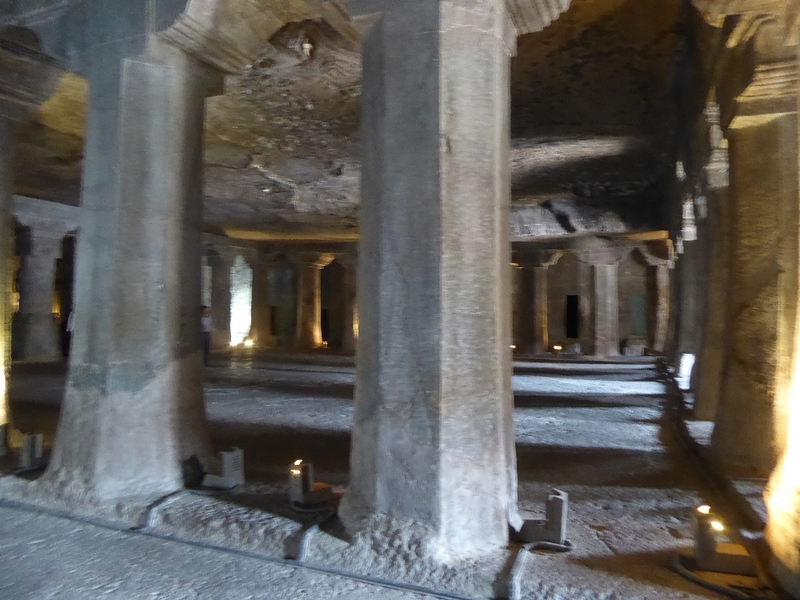 This gets way too complicated, but the caves were usually built with donations from fatcats seeking merit. 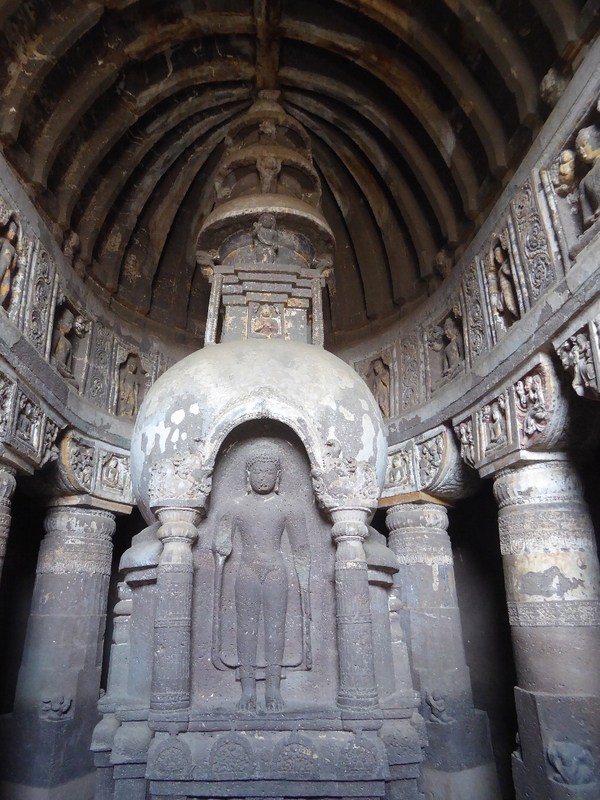 (Some things never change) There was Varahadeva, of course, and there was his boss Harisena, whose death in 478 brought construction at Ajanta to a halt. There were other donors, including Buddhabhadra, which raises another pesky question: what's a monk doing with such wealth at his disposal? 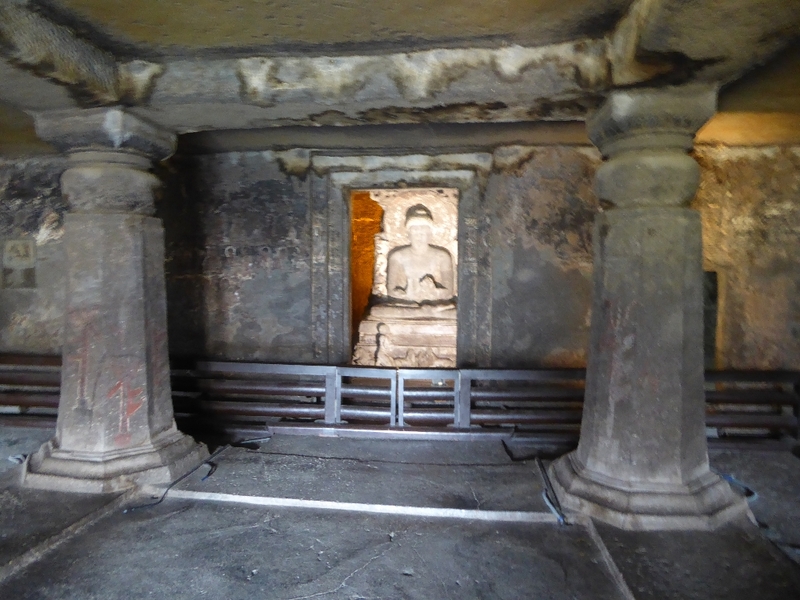 Once the political structure collapsed with Harisena's death, small fry got into the picture, sponsoring single images of the Buddha wherever they could find a bit of vacant wall. Although Harisena was the king, he got into the cave-building game late and so got a bad spot at the far end of the line. Now, with industrial-scale tourism, his cave comes first. It's even numbered first. Better late than never, he might say. 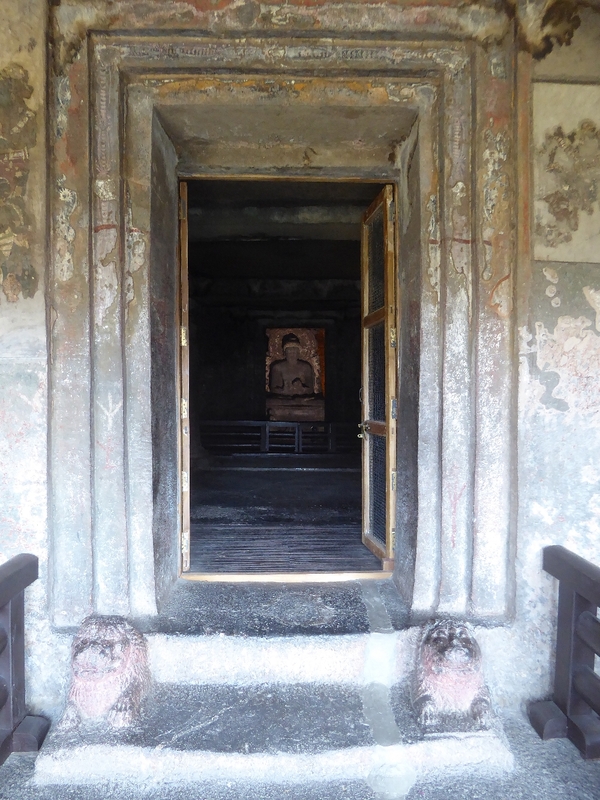 Here's the view from 16, the prime minister's cave, down the stairs to the elephant door. See the arch of Cave 10? 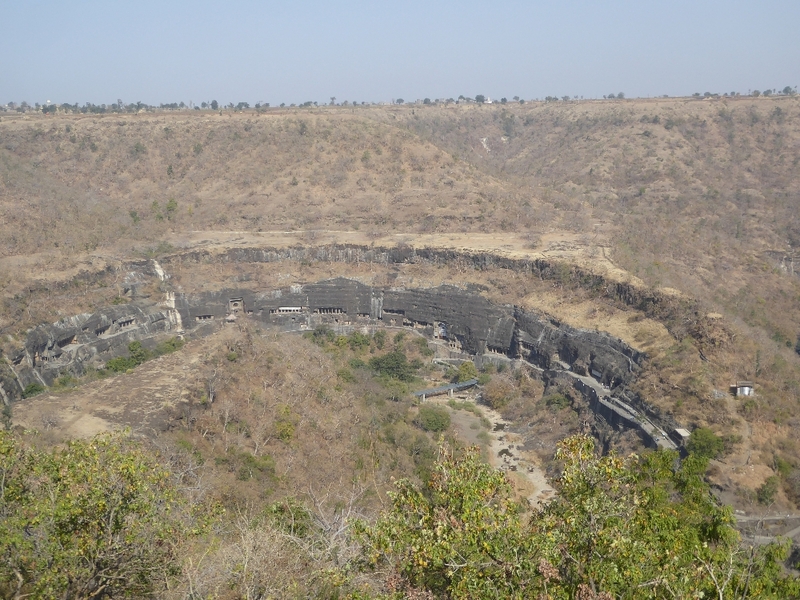 Captain John Smith saw it in 1819 and in so doing put Ajanta on the European map of India. 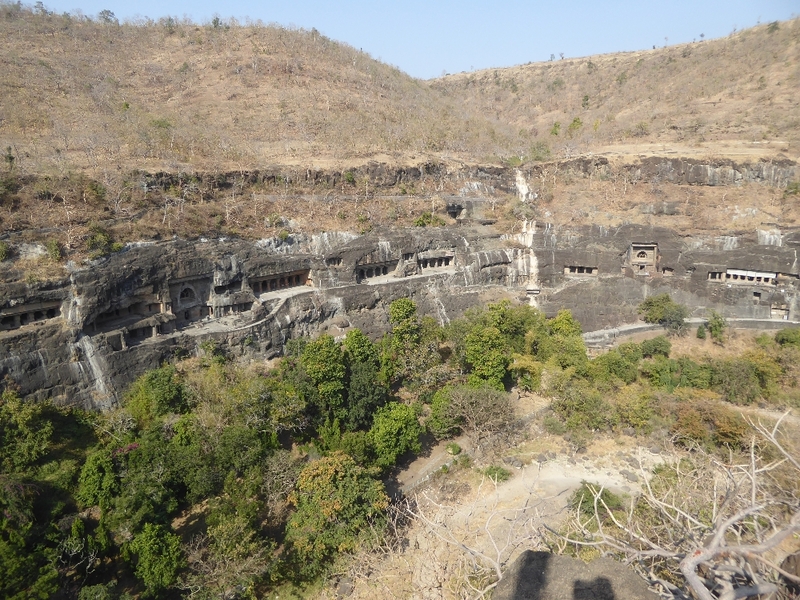 The caves at that time were almost entirely obscured by flood debris and rockfalls and weeds, but the arch on Cave 10 stood out from Smith's position on the ridge across the canyon. 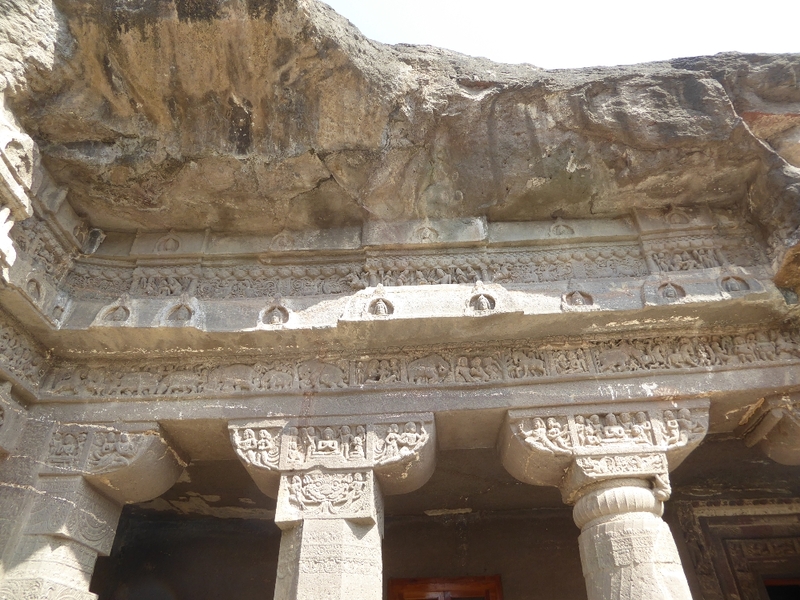 Smith cajoled or badgered or paid local villagers to clear the entrance enough for him to get inside and leave his signature, still there after two centuries. Just a bit more practice: see 17, 16, 10, 9, 2, and a bit of 1? Sure you do. 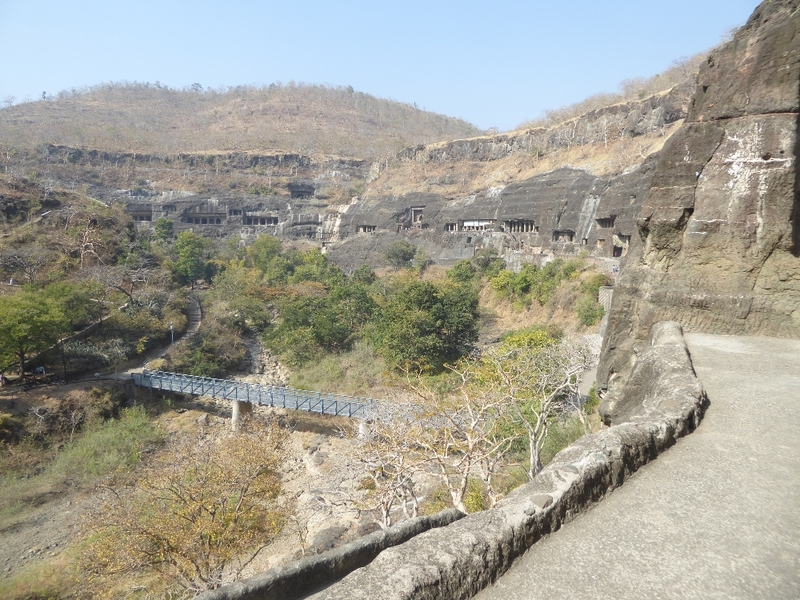 Here's the bridge that put Ajanta tourism on the map. It's dated 1938 and is used now only by the site's shuttle buses. We're on a second bridge, newer and used by shuttle buses going the other way. Tells you something. We'll look now at the four chaityas, beginning with Cave 9. There's a "Wow!" factor that I don't want to disturb. (Spoiler ahead, of course.) 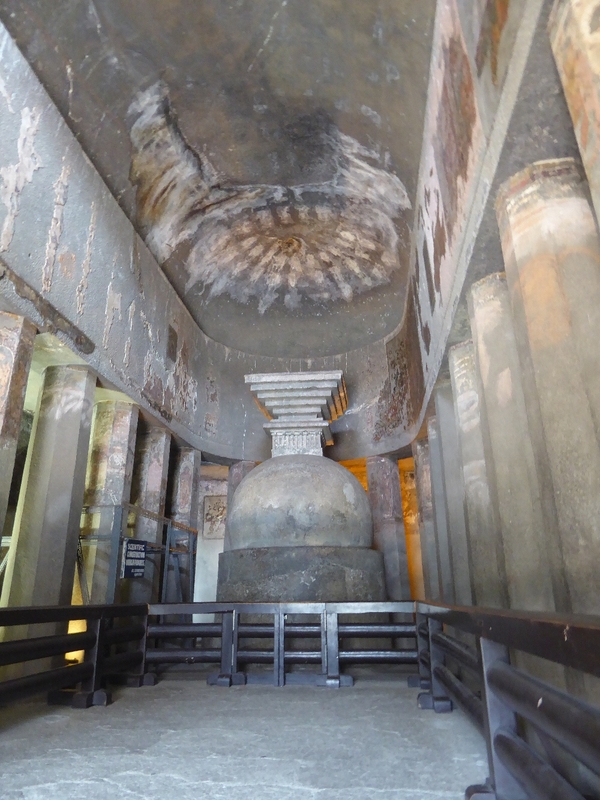 But notice the huge window built to light the stupa within. Now it's fitted with some modern material, but in the past it had wooden shutters. Here's a more important factoid: this temple dates from about the time of Christ, when Buddhism was aniconic. You'll see this once we're inside. 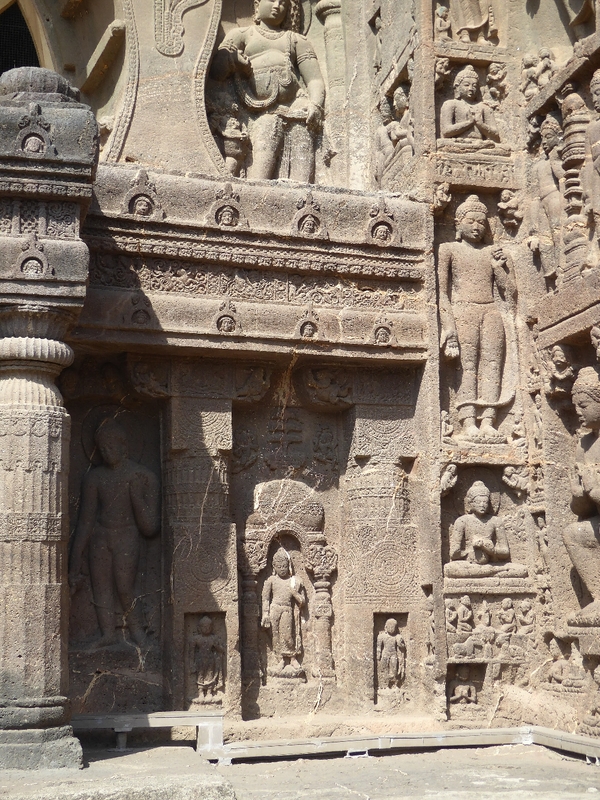 So what are the Buddhas--large, medium, and small--doing on the facade? 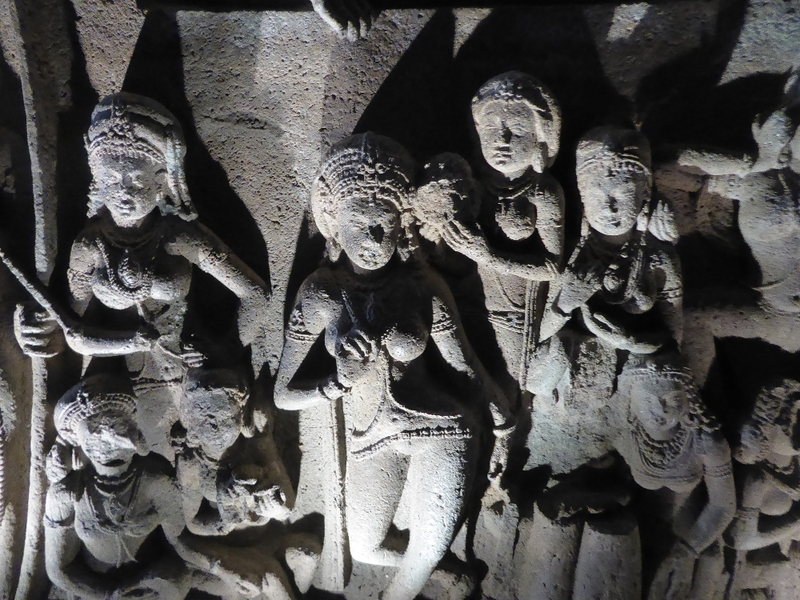 Answer: they're intrusions, added centuries later when Buddhism had become iconic. The men who dug the cave would have been shocked. This transition from aniconic to iconic correlates with the transition from Theravada or Hinayana Buddhism to Mahayana. Isn't the lingo great? 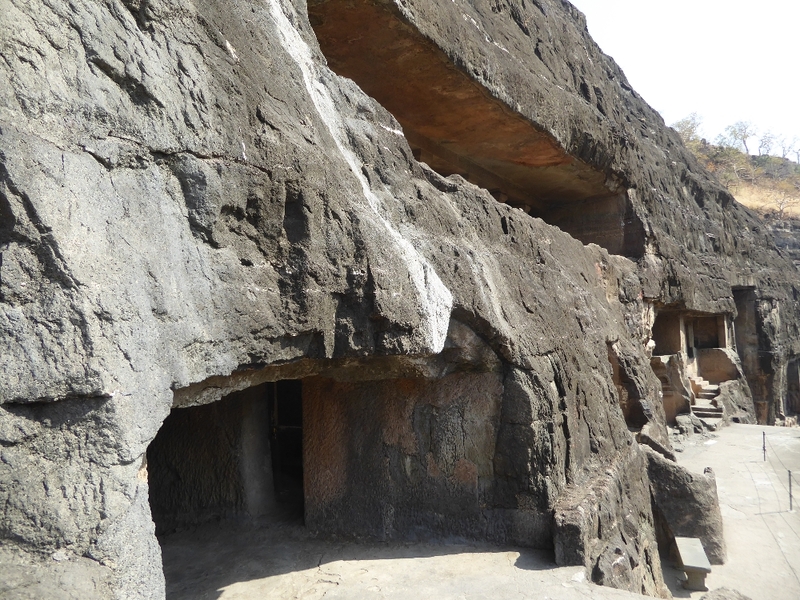 Here's Cave 10, seen from outside 11. It's a century older than 9, much bigger, and with a much plainer facade because it was originally faced with wood. The wood may have been a victim of time, but Hindu villagers with no respect for the place may have stripped it for firewood and construction material. The cement flooring covers large bricks revealed during 19th century clearance of the site. 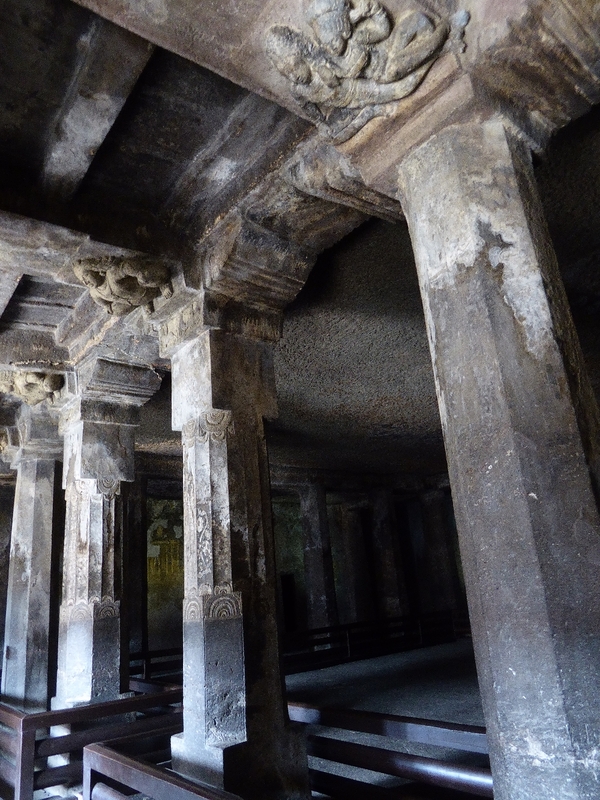 We've jumped to the third chaitya, Cave 19. Yes, yes, we'll go back and look inside 9 and 10 later. 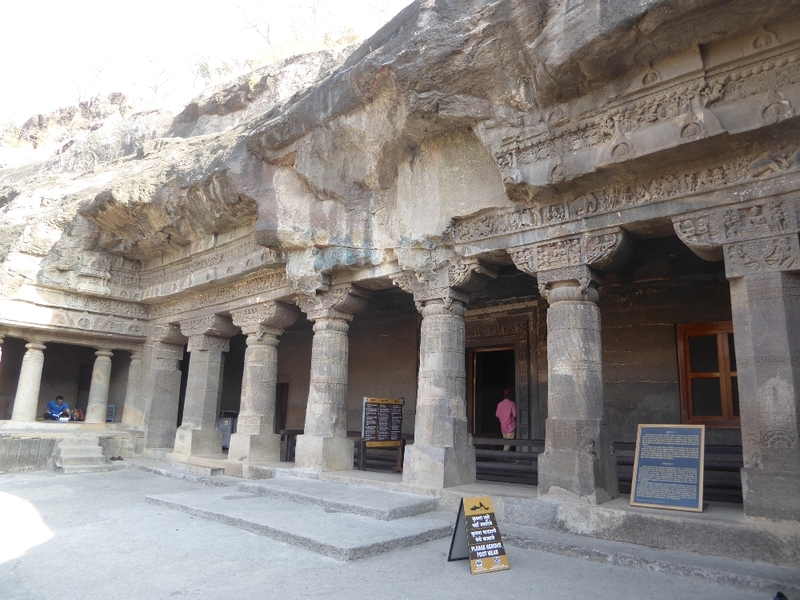 Right now, I just want to notice the contrast between the relatively austere faces of Caves 9 and 10 and the overloaded facades of the later chaityas, Caves 19 and 26. 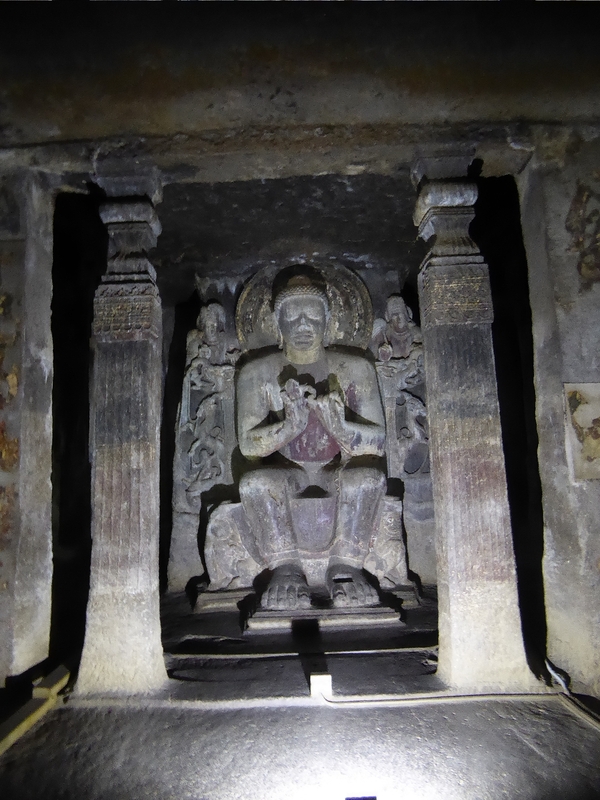 This one, Cave 19, was paid for, at least initially, by Upendragupta, a local sub-king under Harisena. A rival power, the Asmakas took over in 472 but had to quit the site in 479. 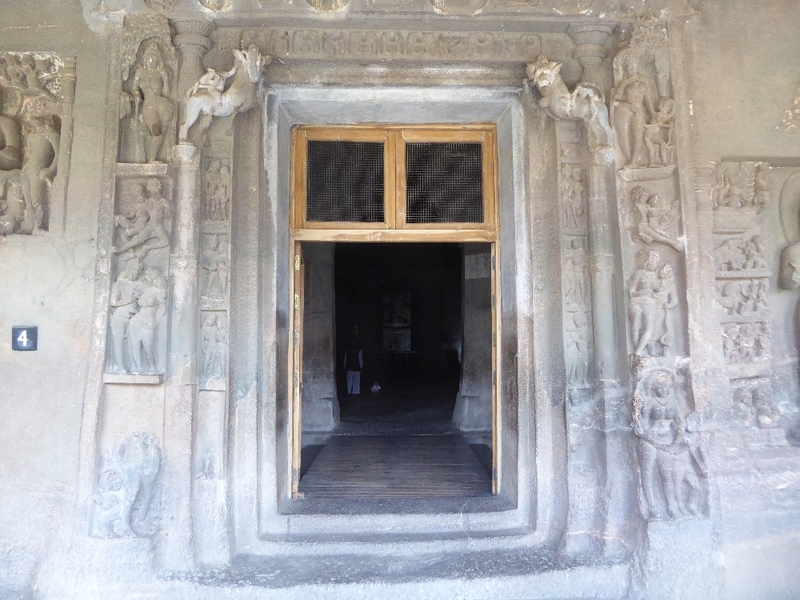 This was a Mahayana facade, designed unlike Cave 9 and 10 to include statues, but with the retreat of the Asmakas, small donors moved in and added images on the frames and pilasters. Like highways in the bad old days? OK, highways with some elegant signs, but still congested. 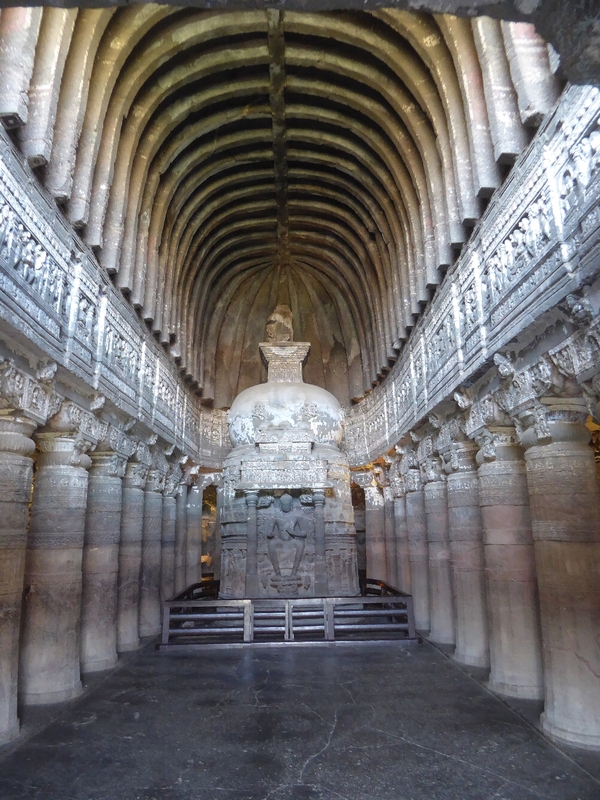 See the budget Buddhas, cut into the base of the pilasters? The figure on the lower right is an intrusion; the larger one isn't. 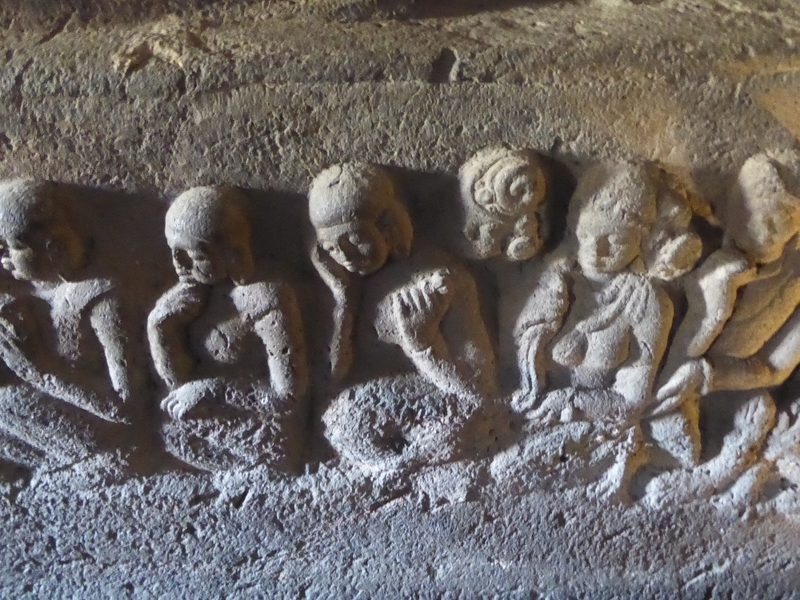 It shows the Buddha offering his son Rahula the boy's inheritance. A kingdom? Not a prayer. Instead, the boy gets a begging bowl. How do you think that would have gone over? I'm betting that in reality it would have been as little appreciated as it would be today. 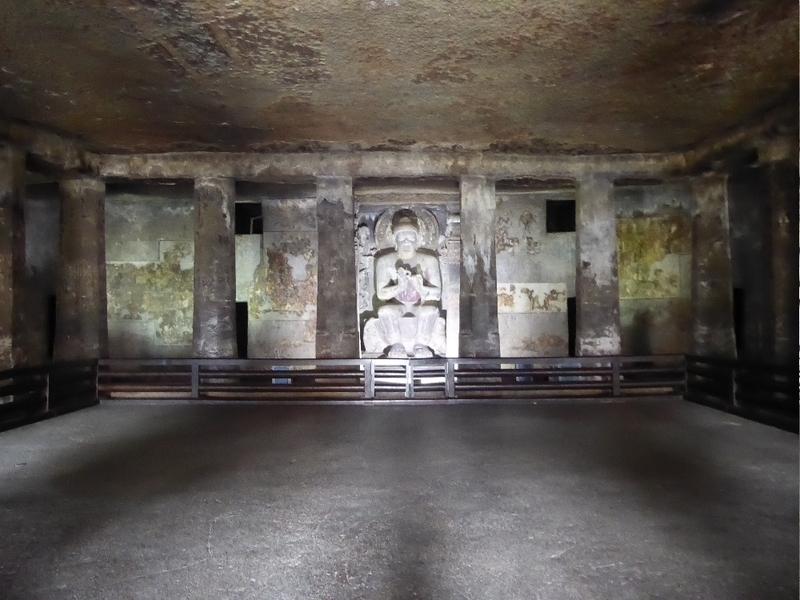 Now we'll compare the interiors of the four chaityas, starting here with aniconic Cave 9. There are obvious similarities to a Christian church, including a high-roofed nave, lateral columns, aisles, a focal point of worship, and an apse. 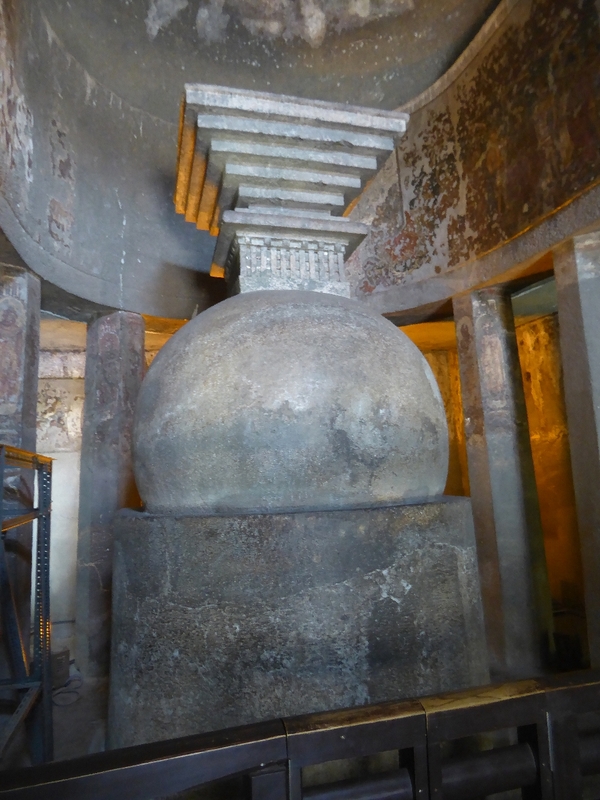 The focal point is a stupa of five parts. The base is the medhi. Above it is the spherical anda or egg. 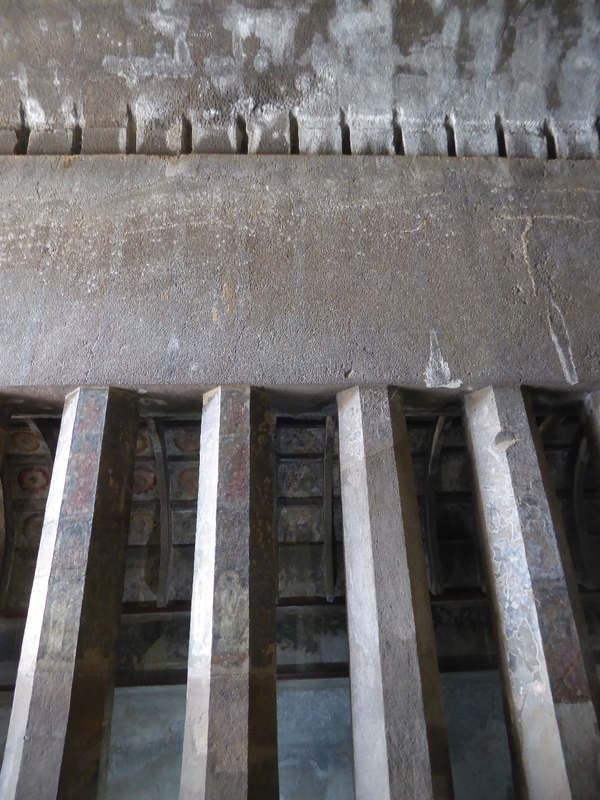 Above that is the relic box called the harmika, and above the harmika is an inverted pyramid that once supported chhatras, parasols symbolizing the Buddha's spiritual authority. 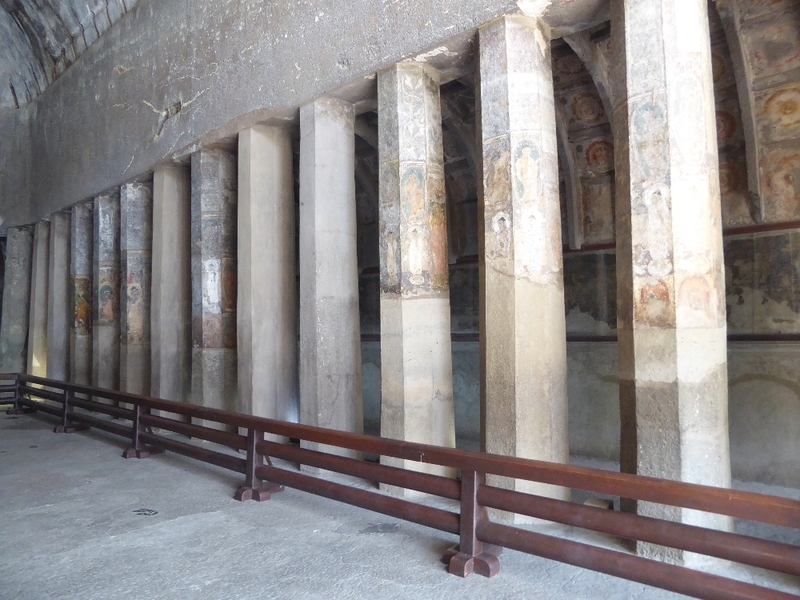 The aisles, by the way, are flat-roofed, and the columns, unlike those of Christian churches, are octagonal. 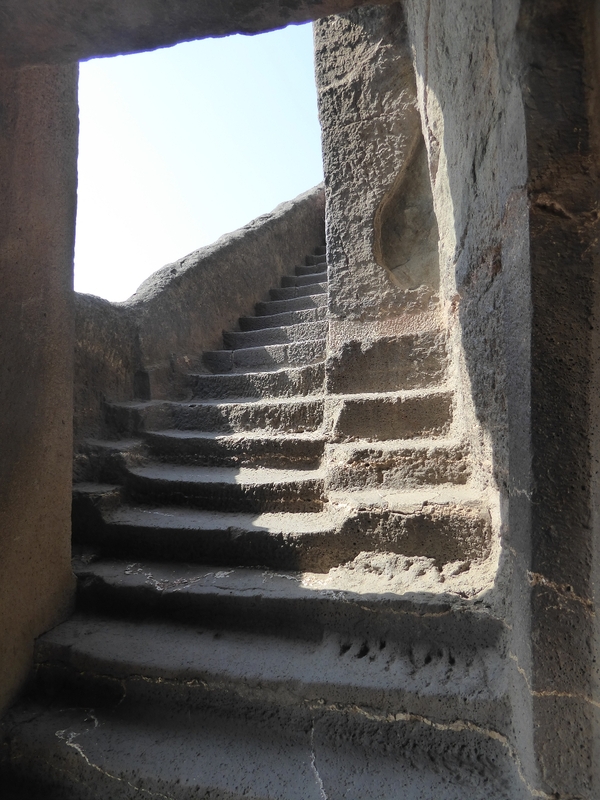 The apse was used for circumambulation, though the Archaeological Survey does its best to preclude any such thing. 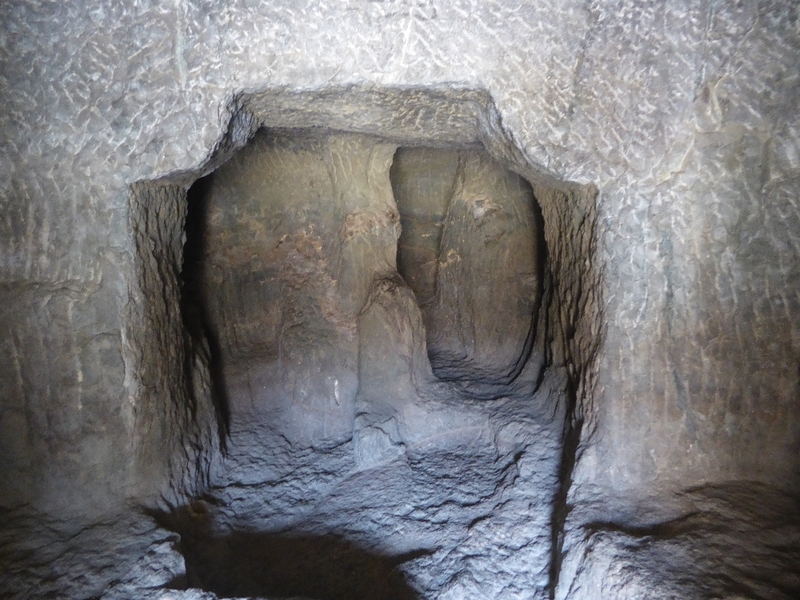 Here's the interior of Cave 10, older and bigger than Cave 9 but so similar to it that you almost have to count the layers of the inverted pyramid to tell them apart. 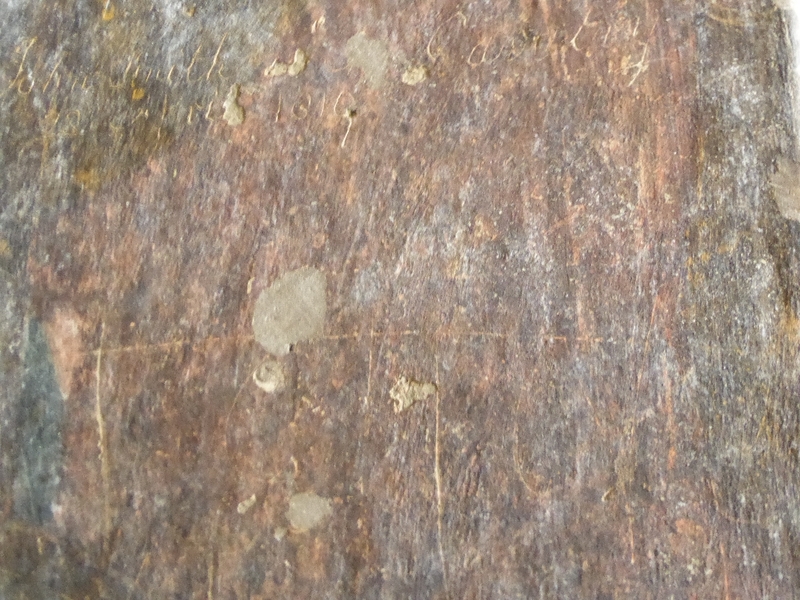 Also, the outlines of the old timber ceiling are much more visible here than in Cave 9. Old photographs show several of the columns on the left broken or missing. They've been skillfully replaced. 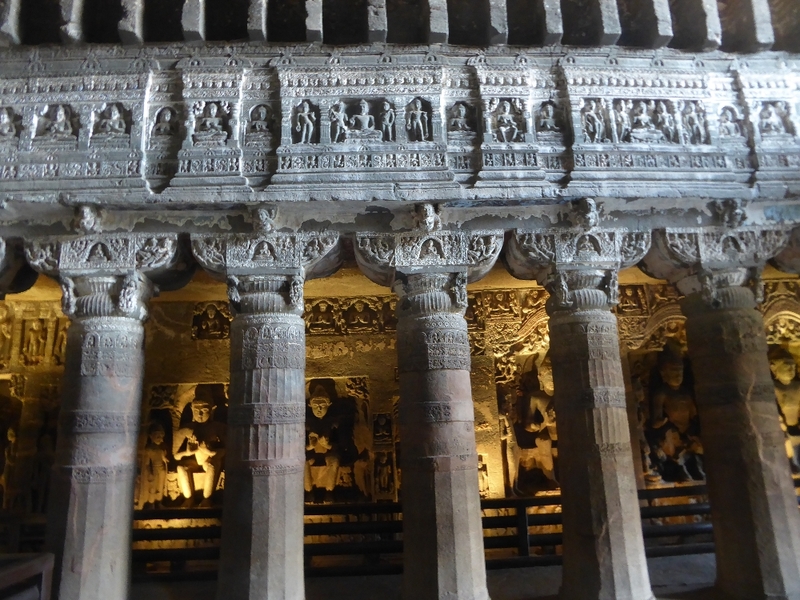 We can argue whether that's good or bad, but it isn't the only instance of such reconstruction at Ajanta. A closer view. Captain Smith in 1819 stood on several feet of accumulated debris. We know this from his signature, which appears on the last painted column on the right at a height of about seven feet, inconvenient for us but at shoulder height for him. A good picture of the blank entablature, the octagonal columns, and the framework that once held the wood fittings that made the hall feel right and properly traditional. Right side of the hall. 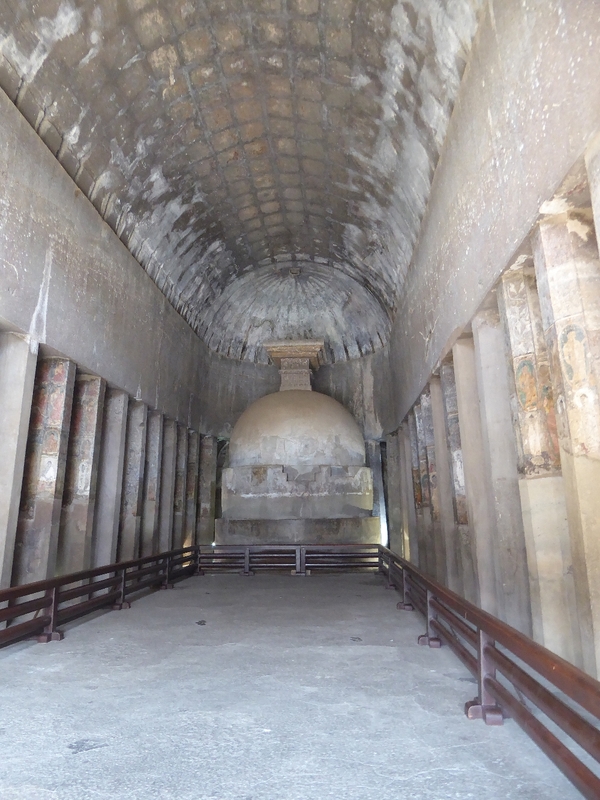 Now hang onto your hat, because we'll switch to the Mahayana version of the chaitya. A little different, eh? 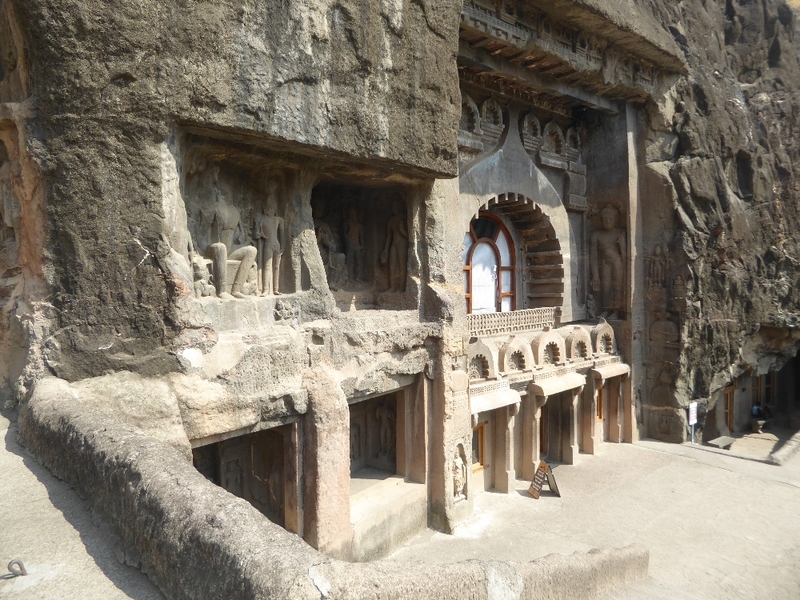 This is Cave 19, five hundred years later than Cave 10 and built in an era when worship of the Buddha had replaced contemplation of his philosophy. An improvement? Each to his/her own, say I. 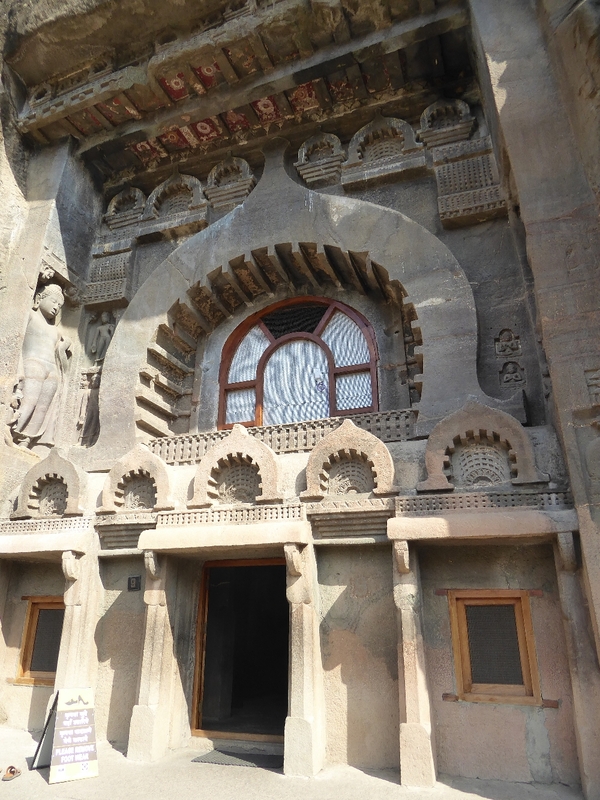 Apart from the furious ornamentation, the parasol or chhatra survives atop the harmika. The chhatra is one of the Eight Auspicious Symbols of Buddhism. Like the tiny figures supporting them? Hardly an inch of the entablature is left alone. 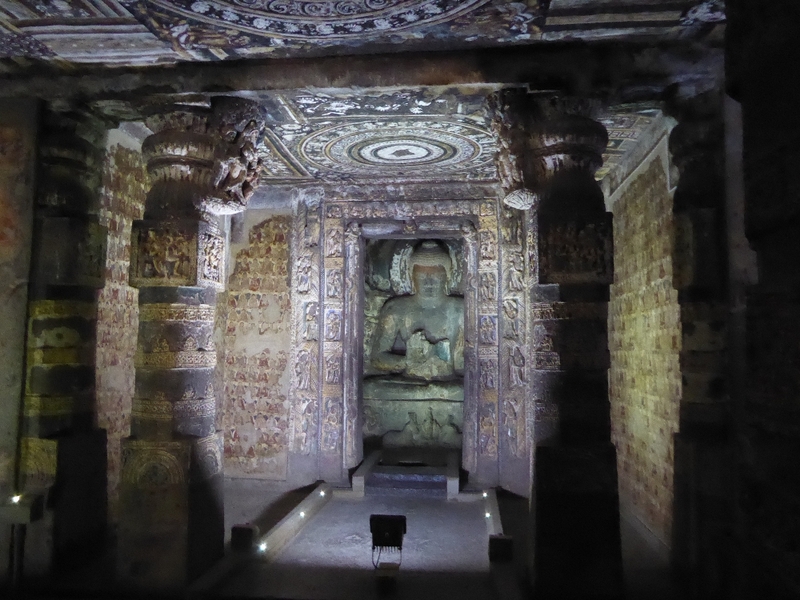 The sitting Buddhas are shown in two customary positions, the dharmachakra or teaching position or mudra on the left and the abhayamudra or "have no fear" mudra on the right. The figures aren't quite aligned. A design error? 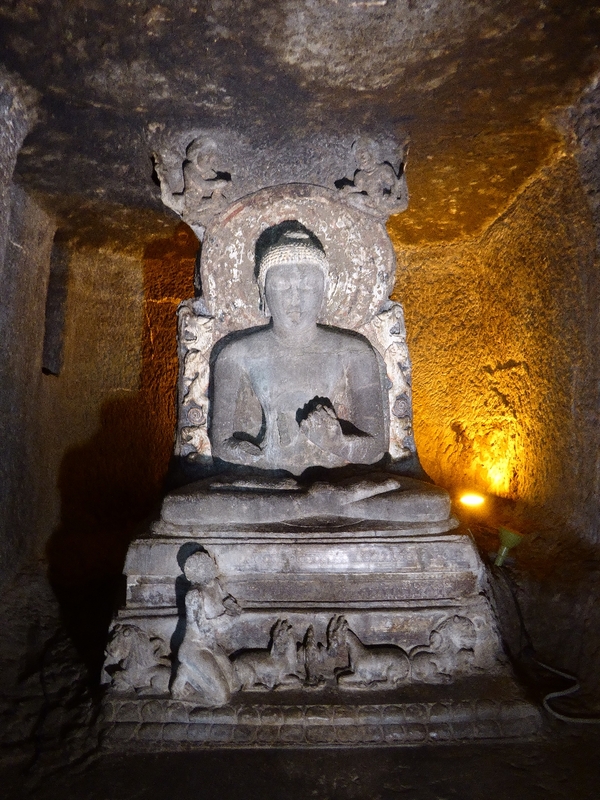 Here's Cave 26, with the Buddha again integral to the stupa but shown, in the style of the slightly later day, sitting on a throne. The parasols have been lost, as has the timber framing. 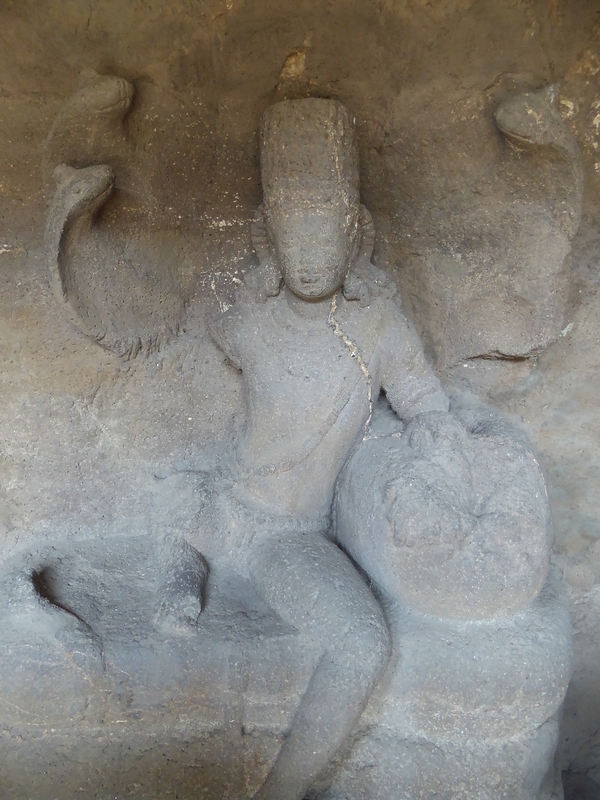 The figures that usually flank the Buddha have, for lack of space, been moved onto the drum. Is the aisle wall a bit formulaic? 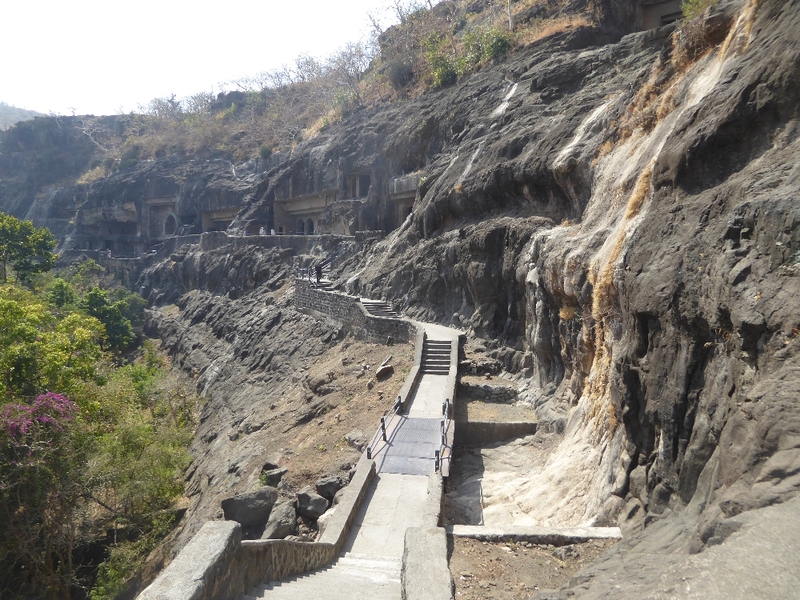 Here's something unusual for Ajanta. 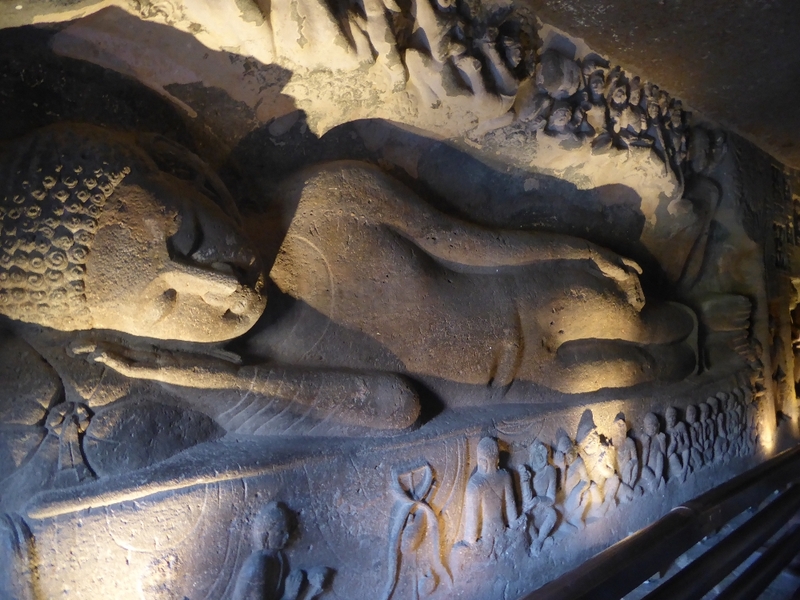 On the wall of the left aisle in Cave 26, there's this figure of the Buddha in Mahaparinirvana. The figures below grieve what they see as his death. Those above know better and celebrate. He himself doesn't seem the least troubled. 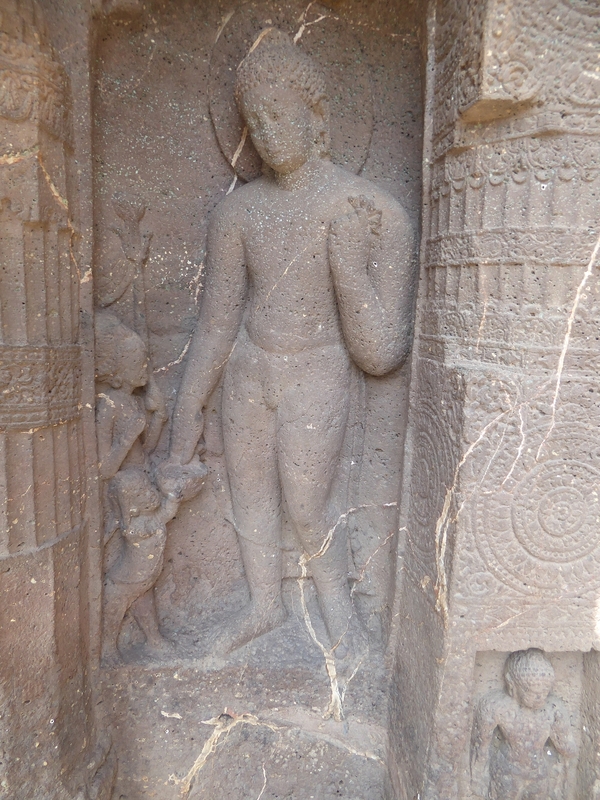 A few feet farther along the wall is this relief of the Buddha at the moment of his Enlightenment, symbolized by his touching the earth in the bhumisparsha mudra. Notice the elephant at the upper left. That would be Mara, the demon seeking to tempt the Buddha. 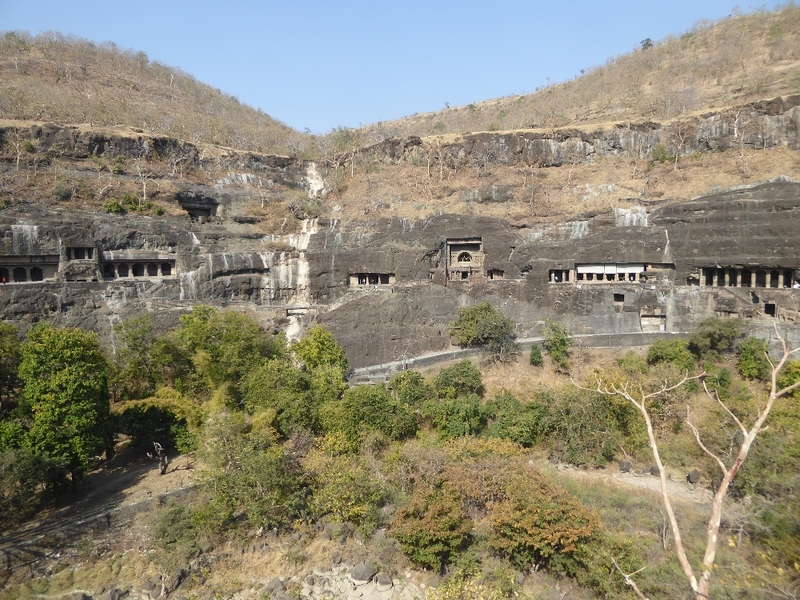 For a long Buddhist narrative of his futile efforts, see James Burgess, The Rock Temples of Ajanta, 1879, pp. 85-89. Burgess here quotes at length from S. Hardy, A Manual of Budhism [sic], 1880, p. 175f. He attacks with his seductive daughters, but they fail in their mission and leave Mara (unfortunately not visible here) sitting disconsolate at the lower right of the panel, where in his frustration he scuffles the earth with a stick. 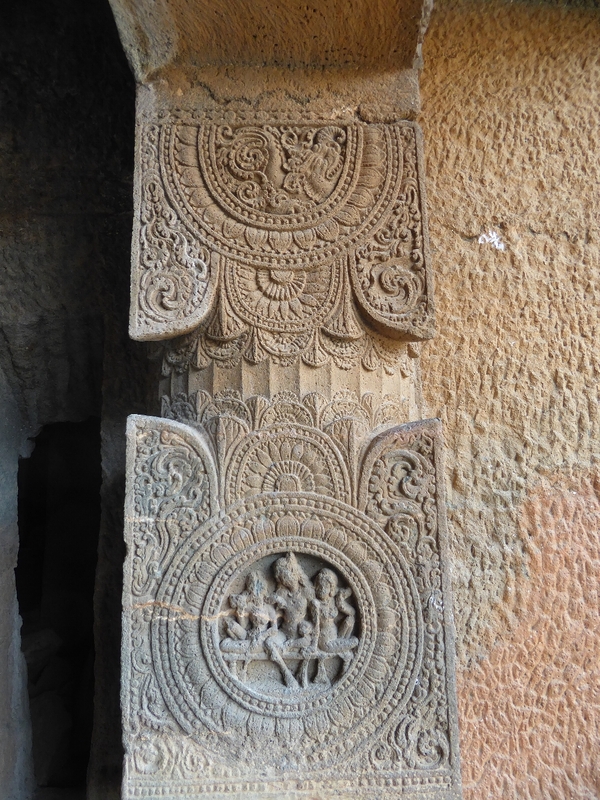 We'll take a look now at the viharas, starting with these unfinished ones between 20 and 21. The general pattern was to dig a tunnel, then create lateral branches, then remove the space between the branches. For the chaityas, digging started at the top and worked not in two dimensions but in three. Here's a bit of a cave abandoned early in the process. Tools? Waste disposal? Design guidance? Wish I knew. 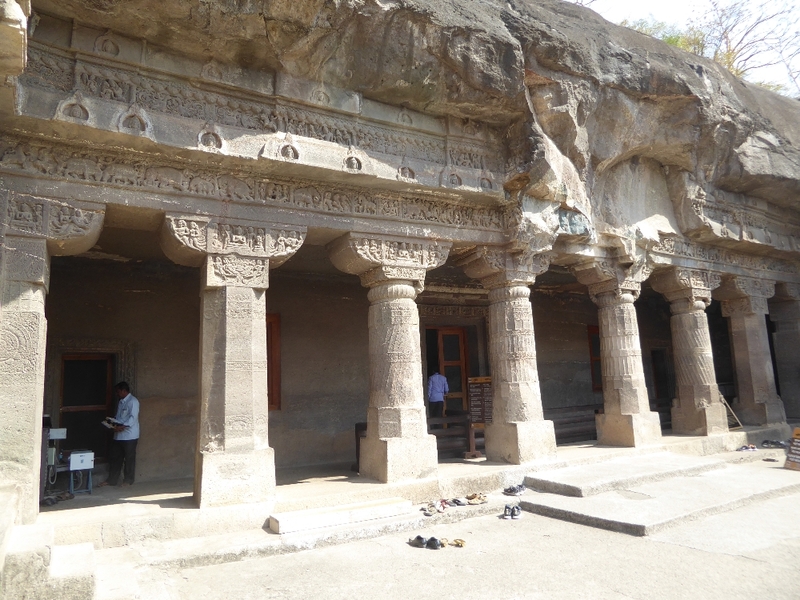 Here's Cave 12, one of the three early viharas and contemporary with the aniconic chaityas. 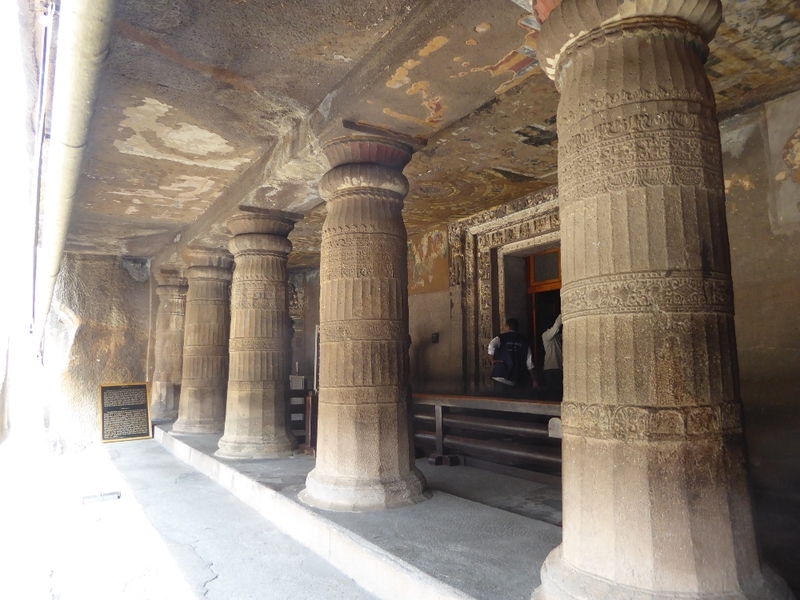 The veranda has collapsed, and the present edge is held up with modern columns. You can faintly make out some details of the interior. Here's the inside. It has twelve cells, each with two benches serving as beds. In other words, there's accommodation for 24 monks. 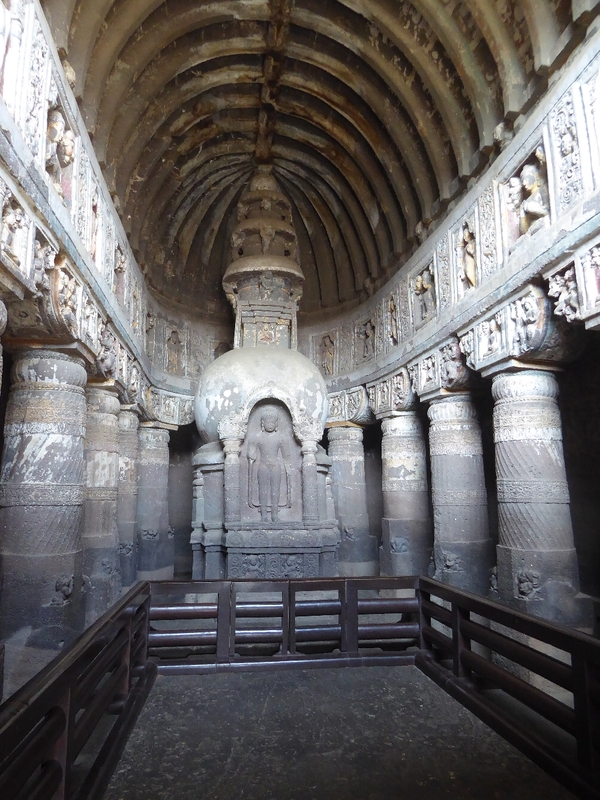 Not much else, except for the canopies evoking the chaitya window. The doors are obviously modern, but the cells originally had doors, too. The rectangular recesses? Your guess is as good as mine. The shape of the vihara will hardly change in later centuries, but the vihara will take on the additional function of being a temple. 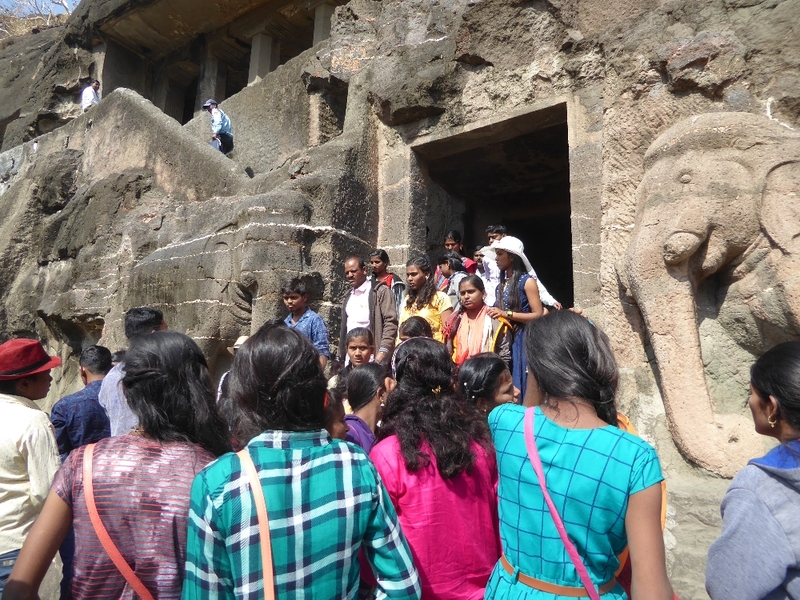 To see that change, we're back at Cave 16, the prime minister's cave atop the stairs by the elephant door. It looks intact, with a handsome porch, but by the 19th century all the columns except the farthest one were missing. They're been replaced skillfully enough that most visitors assume that they're original. 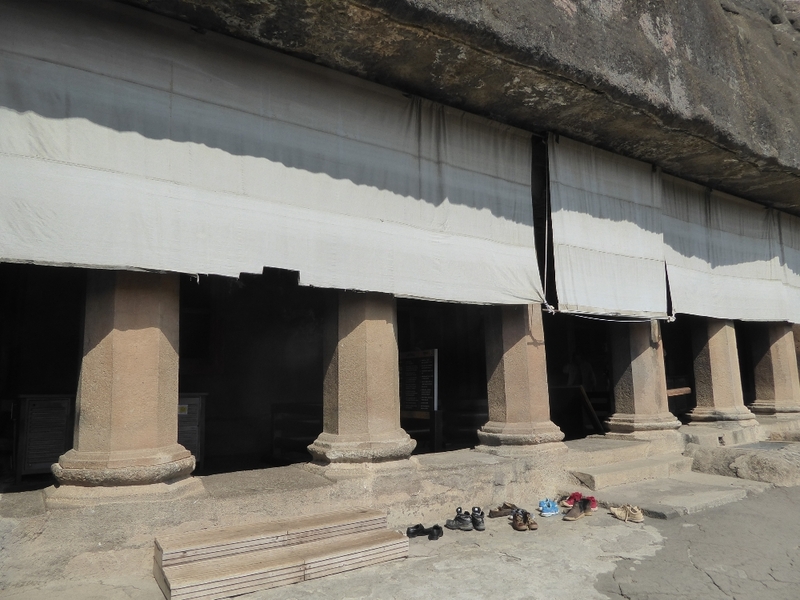 Although there are residential cells on the sides of the cave, a shrine has been added, along with a peristyle of interior columns. The shrine carries an image of the Buddha in the instructive dharmachakra or teaching mudra. There's also room behind him for monks to circle around it. 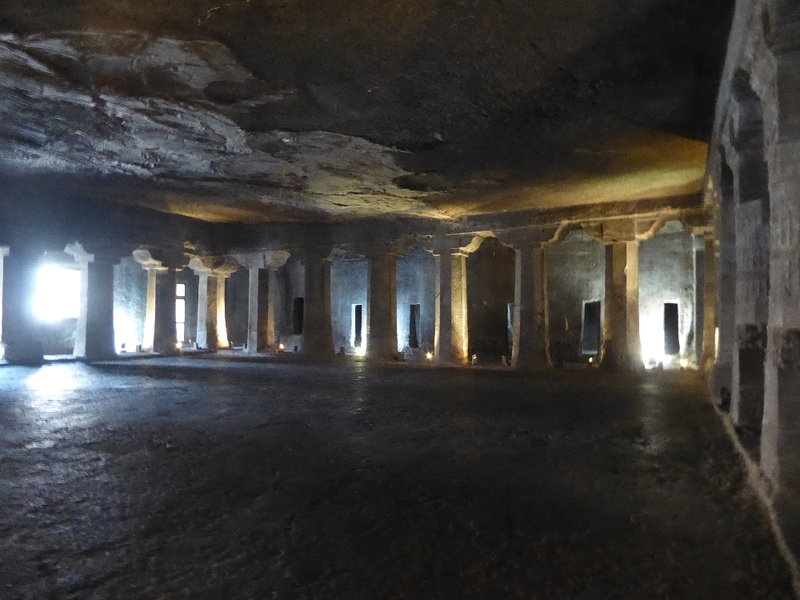 The pattern establised in Cave 16 was repeated in all the late caves, including Cave 4, the biggest of the viharas. Note the tree goddess at the upper left. If your eyes are good, you may discern a chipmunk running midway up her staff. 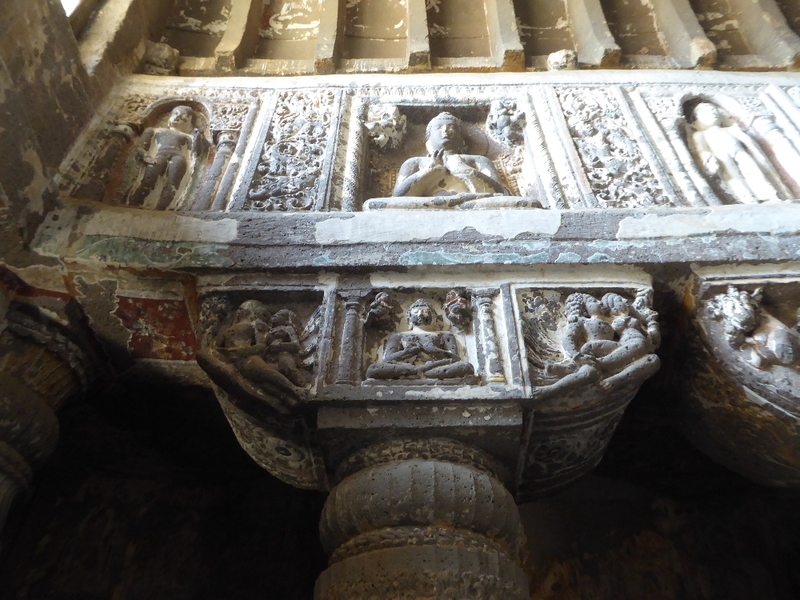 Scholars have taken this since the nineteenth century as a nice example of the technical mastery of Ajanta's later sculptors, who it seems had a sense of humor, too. The large figure on the right is an intrusion, added in the troubled times after the death of Harisena. The figure is Avalokiteshvara, and the small images surrounding him illustrate the litany of dangers facing travelers and against which he offered protection. 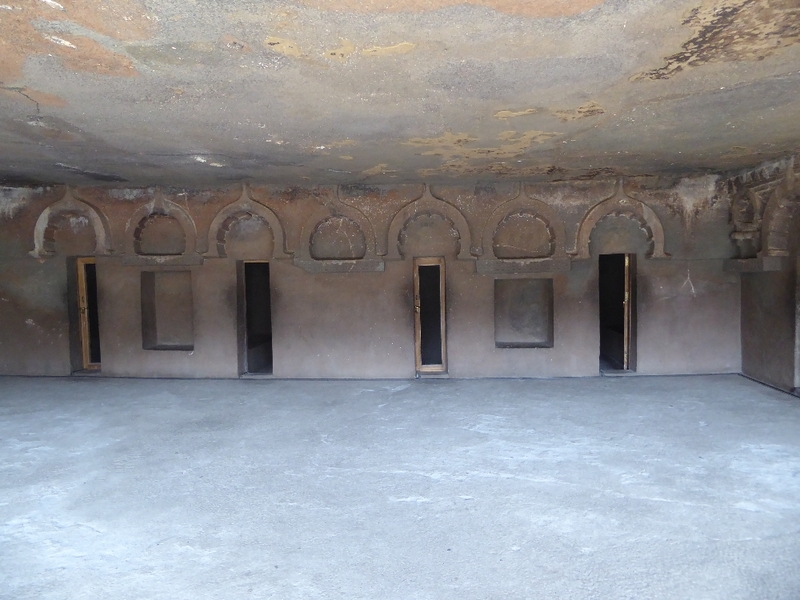 Here's the inside of Cave 4, with a peristyle, residential cells, and an inconveniently collapsing ceiling. Not to worry; it happened at the time of excavation. The donor was Mathura, described as a wealthy devotee. Perhaps he worried a bit about the fate of his donation. Seems he needn't have. View from the peristyle. Same old, same old octagonal columns. 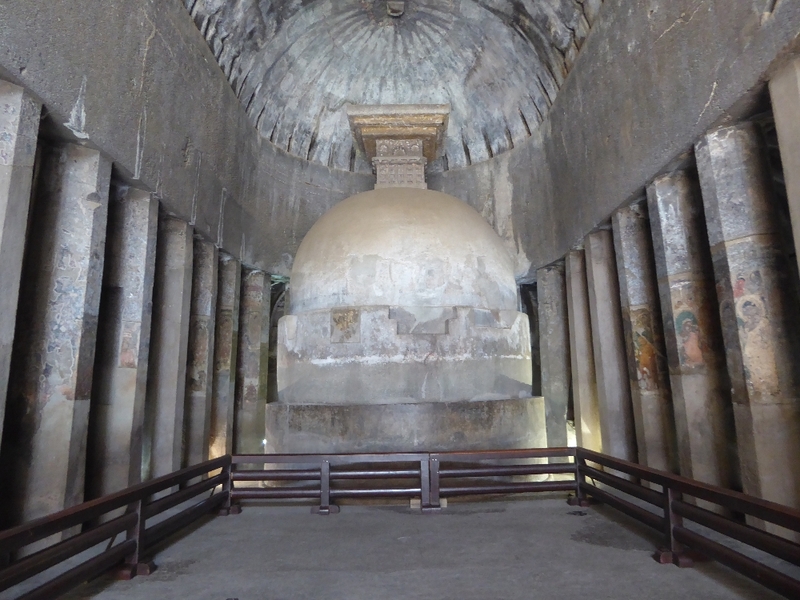 It holds the largest Buddha at Ajanta. How's that for a meaningless fact? Trouble is, guides just exude such trivia. With vihara layout standardized, how could donors make something special. The short answer is going in for opulence. 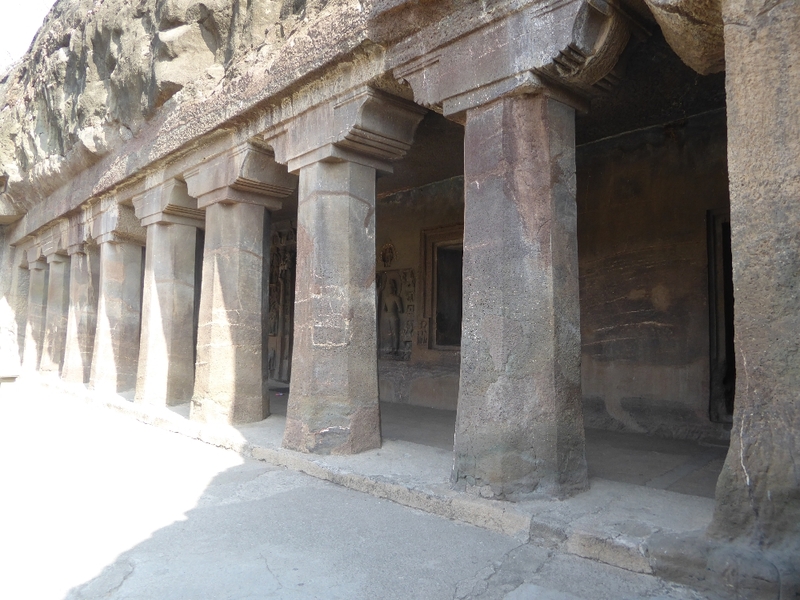 Cave 24 was never completed but does have handsome porch columns. Still with 24 and looking at a pilaster. Hey, if this is the ascetic life, maybe monasteries aren't so bad. 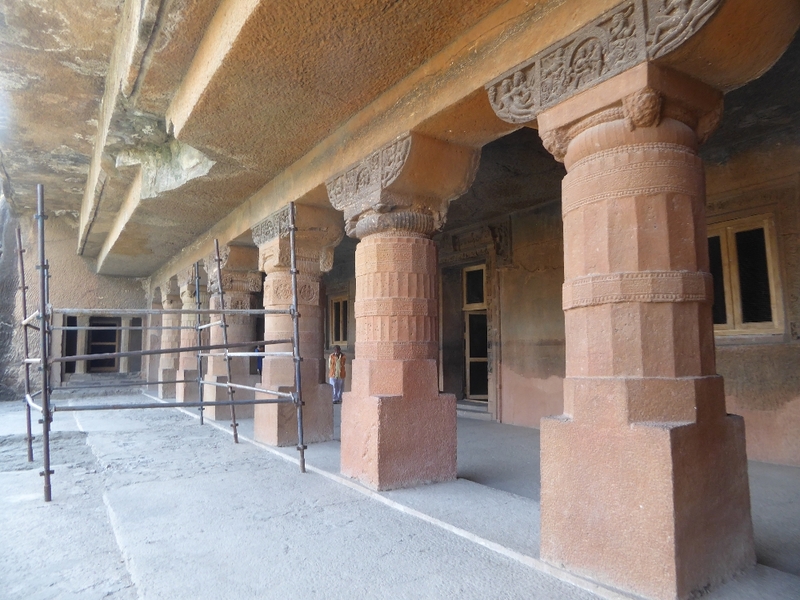 Cave 7 is unique in its twin porticos with lotus columns. The columns were missing in the 19th century but have been replaced according to the original design. Here's Cave 11, with handsome lions at the door. The columns taper and change profile. The shrine has room for circumambulation. It also has a worshipper praying at the Buddha's feet. Uniquely, Cave 6 has two stories; the upper was later and deeper. Its builders had greater ambitions but never saw them through. The steps to the upper floor are mostly modern. View from the upstairs porch, with its handsome columns. How's this for magnificent? Welcome to Cave 1, commissioned by King Harisena. 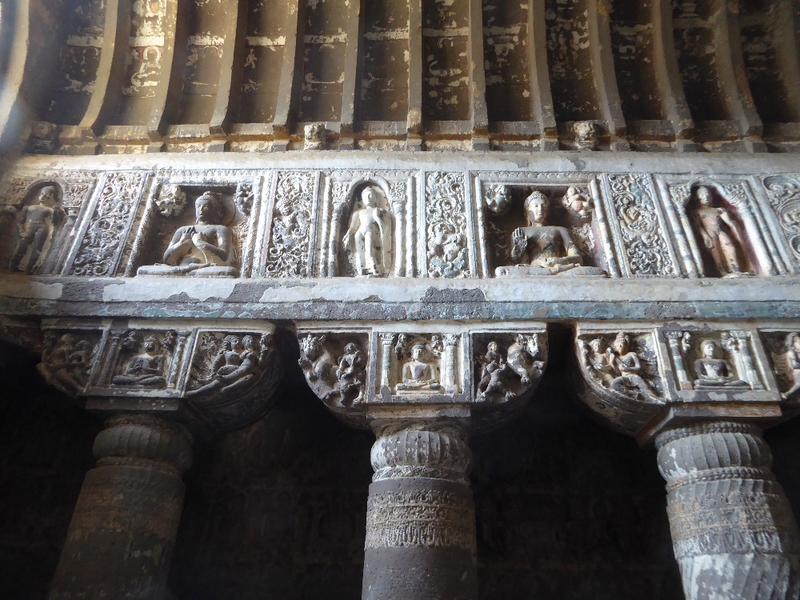 It's the only vihara at Ajanta with figurative carvings on the facade. See the horse above the left edge of the third column? See the figures to its left? We need to get closer. 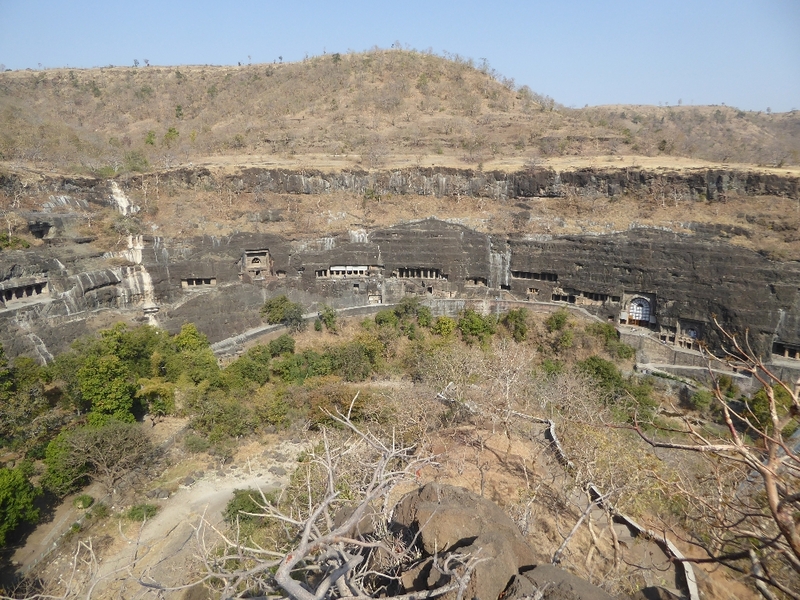 James Burgess began his Ajanta monograph, written late in the century, by lamenting that "unfortunately the damp, bats, natives, and other ignorant visitors have wrought sad ravages among these pictures." Nowadays, vandalism has been stsopped but humidity and light continue to take a toll. 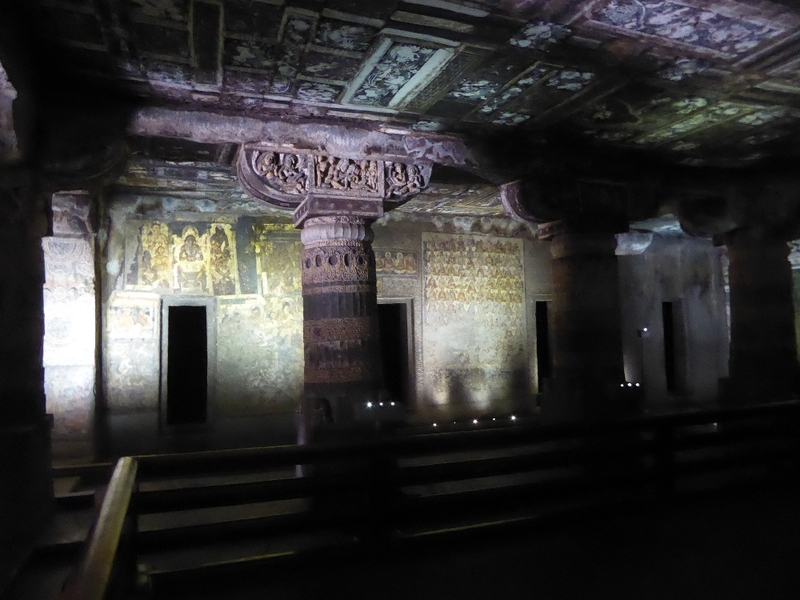 (Notes on the Bauddha Rock-Temples of Ajanta by J. Burgess, 1879, p. 1) The most famous of all the Ajanta paintings is probably this one in Cave 1. Over on the left, there's an illustration from the Sibi Jataka, a tale of a king being ceremonially bathed before renouncing his position. Spink observes that the painting is useful as an indication of daily life for a monarch in the fifth century. 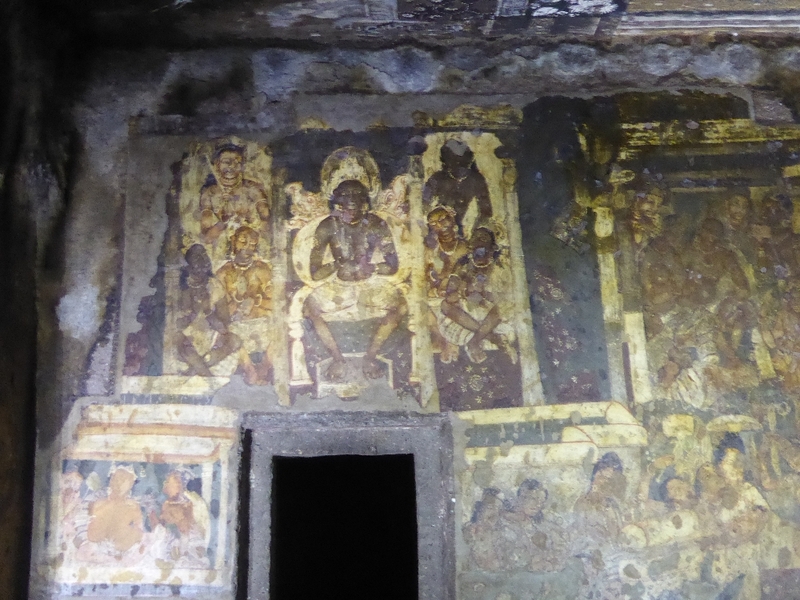 The figure on the right is probably the most reproduced painting at Ajanta, but its identity is unclear. Many guides identify the figure as Padmapani, the lotus bearer, but Zinn observes that he or she holds a water lily, not a lotus and is probably a king serving as an entrance guard. (Monika Zinn, Guide to the Ajanta Paintings, Delhi, 2003, volume 2, p. 2.) Pity that the photos on this website of this and other paintings have plummeted from the Great Mirror's customary standard of mediocrity to something better described as abysmal. But, hey, it's a cheap camera, hand held, no flash, and it's in the hands of someone who can barely operate a cell phone. Or, to get grumpy, "take your own." 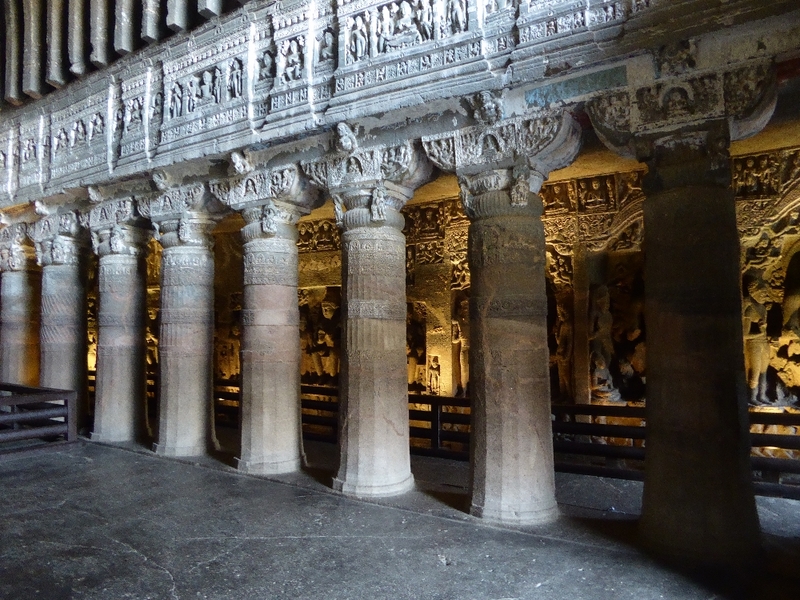 Here's Cave 2, another opulent production, though its donor is unknown. 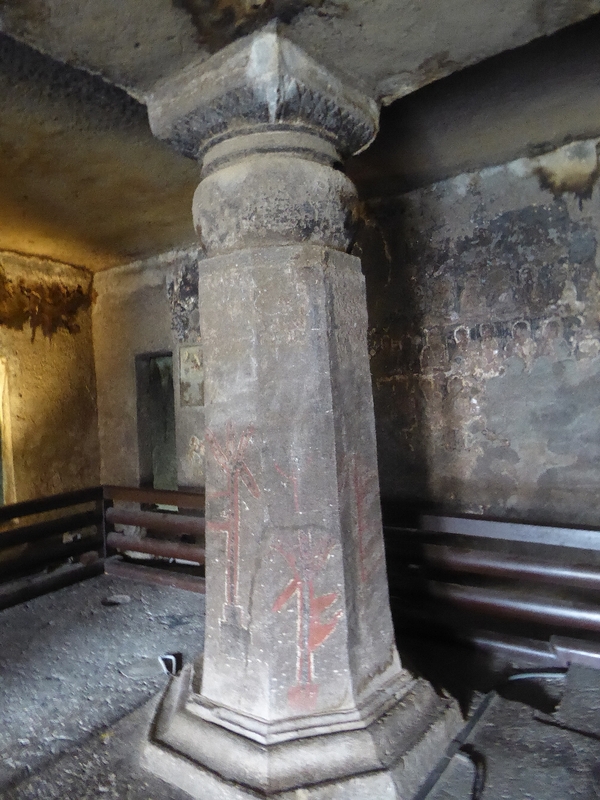 More dalliances on Cave 2's column capitals? 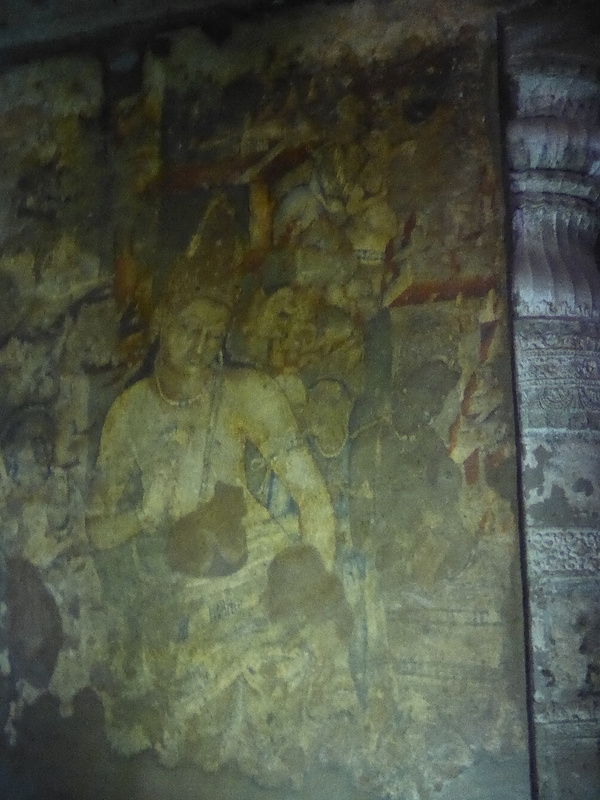 The wall painting on the left shows the Buddha in the Tushita Heaven; the one on the right, the Miracle of Shravasti. Need help? 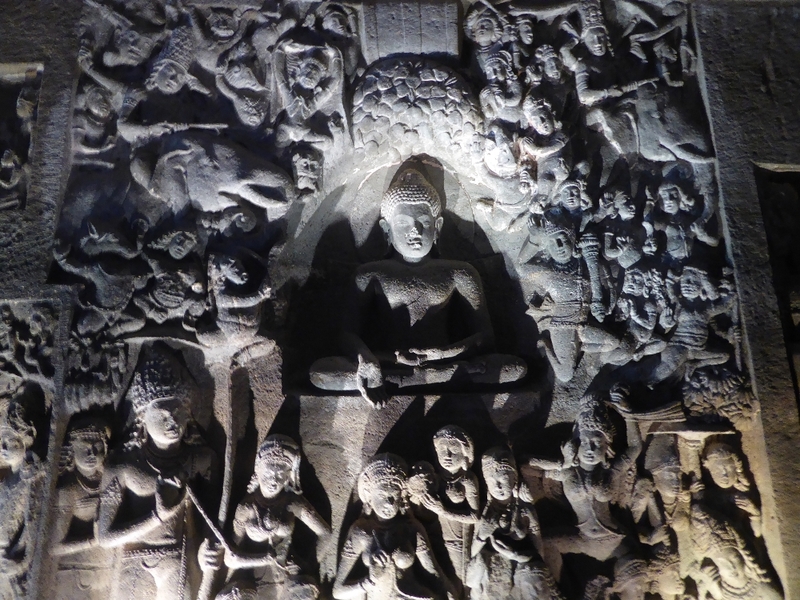 The Buddha, depicted in the Tushita heaven, is preparing to be reborn as the historical or Gautama Buddha. 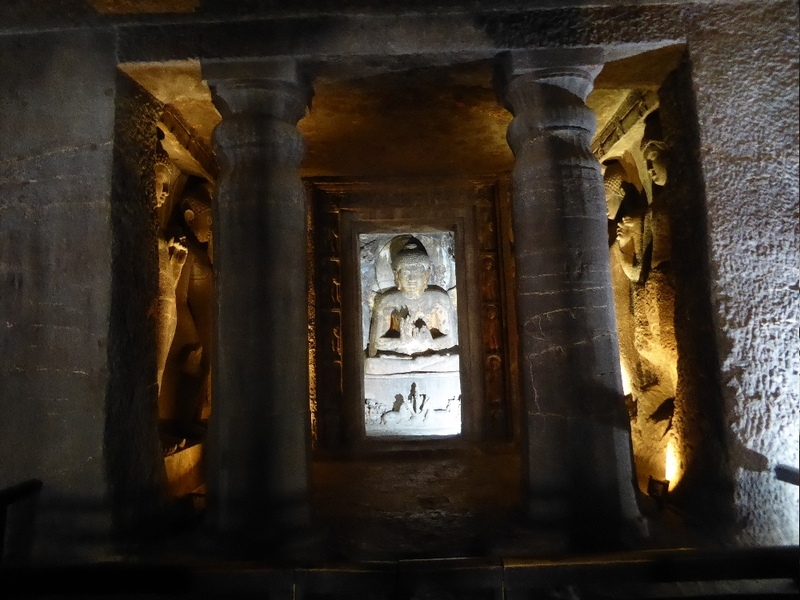 The Miracle of Shravasti appears again around the shrine in Cave 2. The story is that the Buddha was confounding skeptics by appearing in a thousand manifestations. 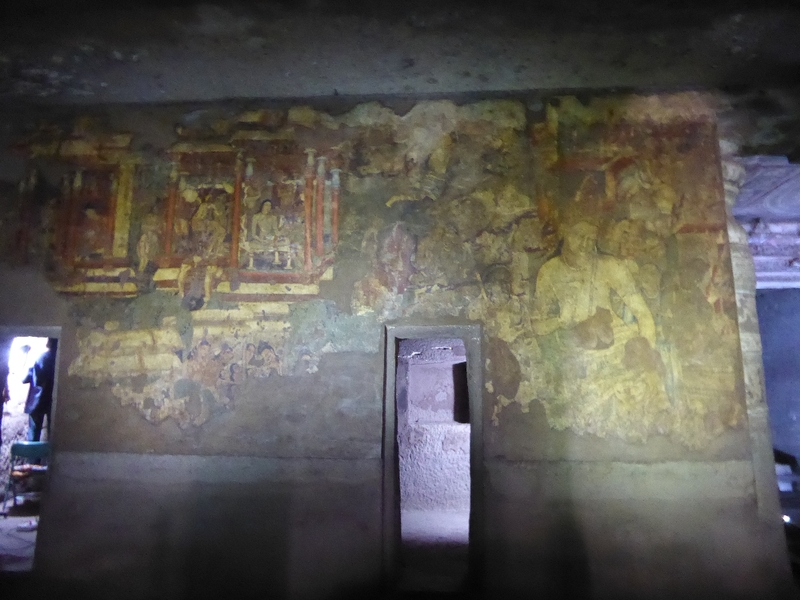 The paintings are a late addition, inconsonant with the original design of the cave. But then, so was the shrine itself, added after work had begun on what the donor thought would be a simple monastery. The damage at the center of the ceiling medallion was caused by repetitive hanging of garlands from a hook. 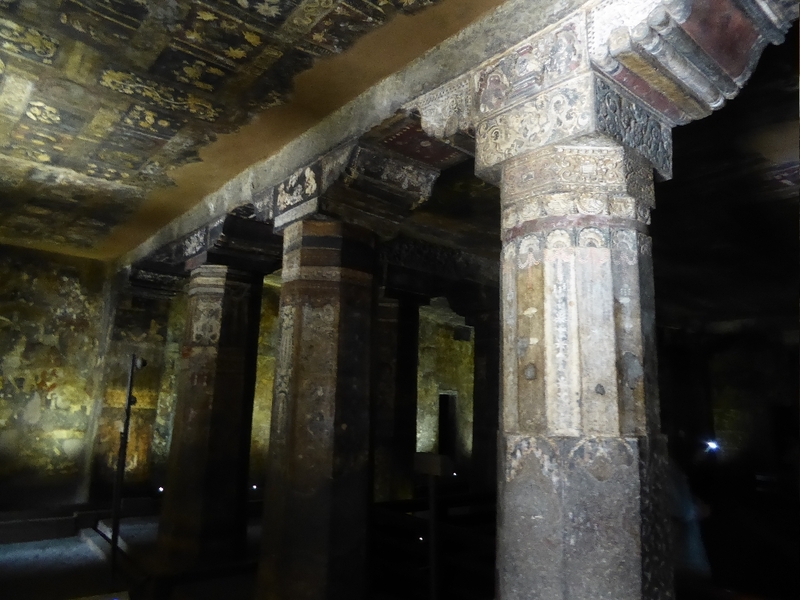 Cave 17, you recall, has a shade to protect its paintings, probably the best surviving at Ajanta. 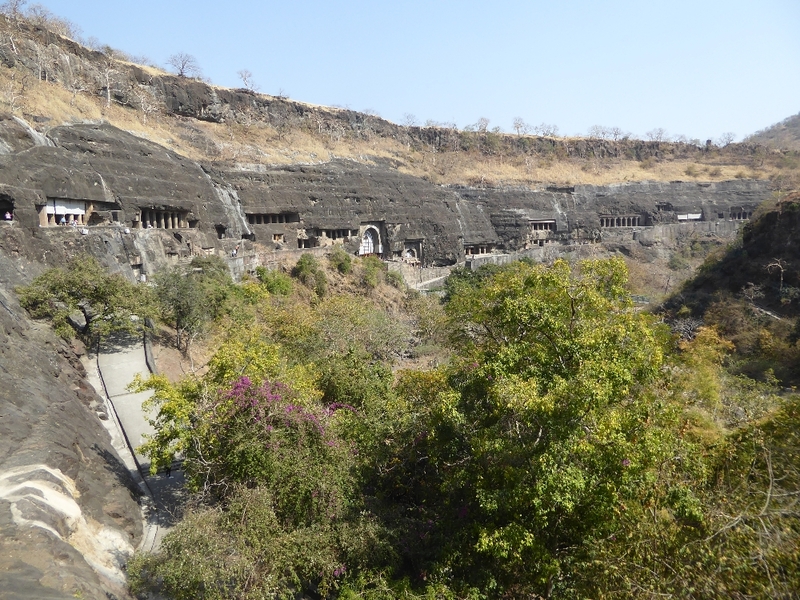 The saga of early copyists at Ajanta is unbelievable, with years devoted to the task, only to have everything destroyed by fire. That's what happened to the work of Robert Gill, burned in the Crystal Palace in 1866. That's what happened to much of the work of John Griffiths, many of whose paintings were lost in a fire at the Victoria and Albert Museum. And that's what happened to the tracings made by Arai Kampo, which were destroyed in the fire following the 1923 Tokyo earthquake. There's lots of wall space to paint. 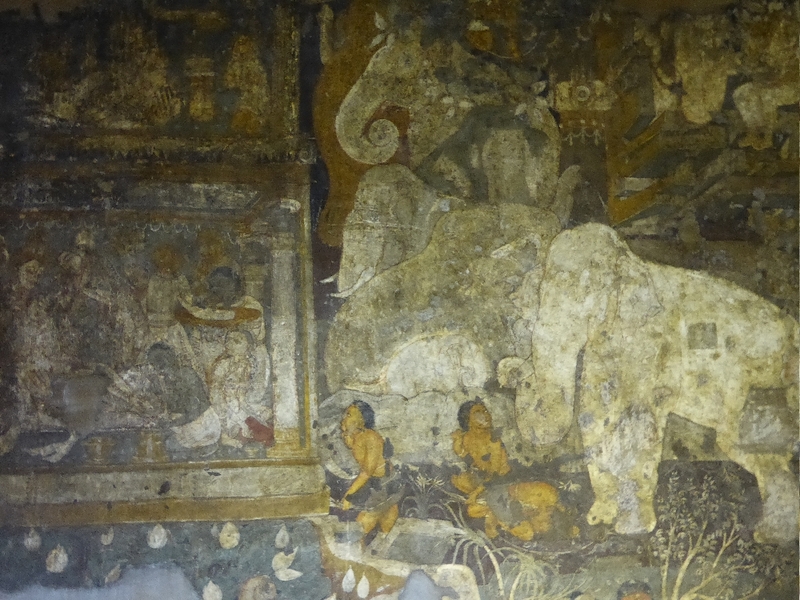 Many of the walls are covered with illustrations of a Jataka, the hundreds of ancient tales of the Buddha's past lives. This is one of the more famous ones, the Chaddanta Jataka, a tale of the Buddha as an elephant with six tusks. The story? King of the herd, the six-tusked elephant has two wives. One is jealous of the other and decides to kill her husband. She becomes human as a queen and, as such, commissions a hunter to bring her her husband's tusks. It takes the hunter seven years, seven months, and seven days (naturally) to find the elephant. When he does, the elephant allows the hunter to take his tusks. When the hunter isn't up to the task, the elephant cuts them off for him, then dies in agony. The hunter takes the tusks to the queen. Overcome with remorse, she dies. The end. Over 500 jataka were translated from Pali into English about 1900 under the direction of E.B. Cowell, a Cambridge professor of Sanskrit. The stories vary in length as modern short stories do, but their tone is from a different universe. This, the Chaddanta Jataka is No. 514 in the Cambridge series and begins like this: "Once upon a time eight thousand royal elephants, by the exercise of supernatural powers moving through the air, dwelt near lake Chaddanta in the Himalayas. 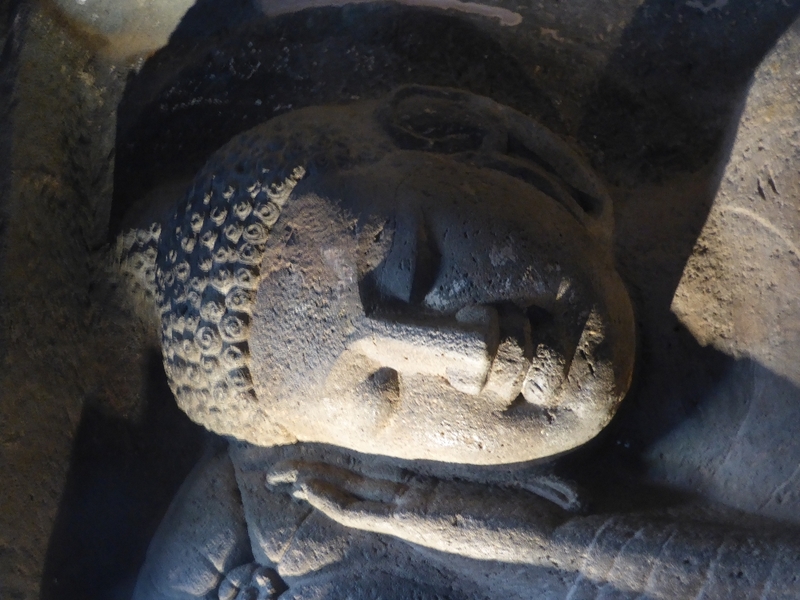 At this time the Bodhisatta came to life as the son of the chief elephant. He was a pure white, with red feet and face." And so on until the last sentence: "And at the remembrance of the Great Being she was filled with so great sorrow that she could not endure it, but her heart then and there was broken and that very day she died." 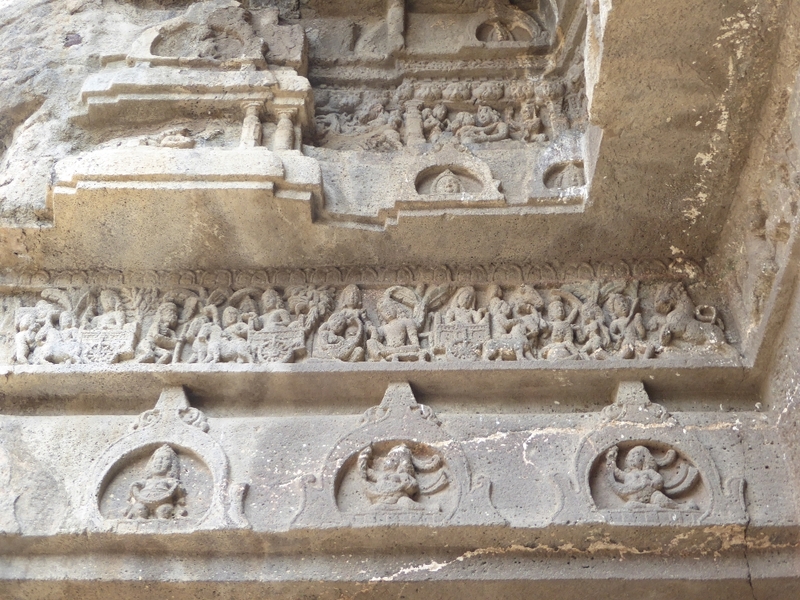 Here's an illustration from the conclusion of the Sivi Jataka, No. 499. A god in disguise as a brahmin speaks to the king: "O great king! in all the inhabited world there is no spot where the fame of your munificent heart has not sounded. I am blind, and you have two eyes"
The king knows what to do. Shortly: "Now all the city rang with the news, that the king wished to tear out his eyes and give them to a brahmin." The king in later conversation with the god in granted a boon and asks for eyes but is told: "By the fruit of the gift by thee given, and by nothing else, your eye shall be restored to you." It was: "And the Great Being, surrounded by his retinue, went back in great pomp to the city..." That's presumably what we see here. The king rides an elephant. Well, what would scholars do without a good disagreement? This may be an illustration from the Visvantara or Vessantara Jataka (No. 547 in the Cambridge edition), in which case it shows Prince Visvantara, and his wife Princess Madri. It's a story of absolute generosity, with the prince giving everything away, including his wife and children. (They all reunite happily at the end, of course.) 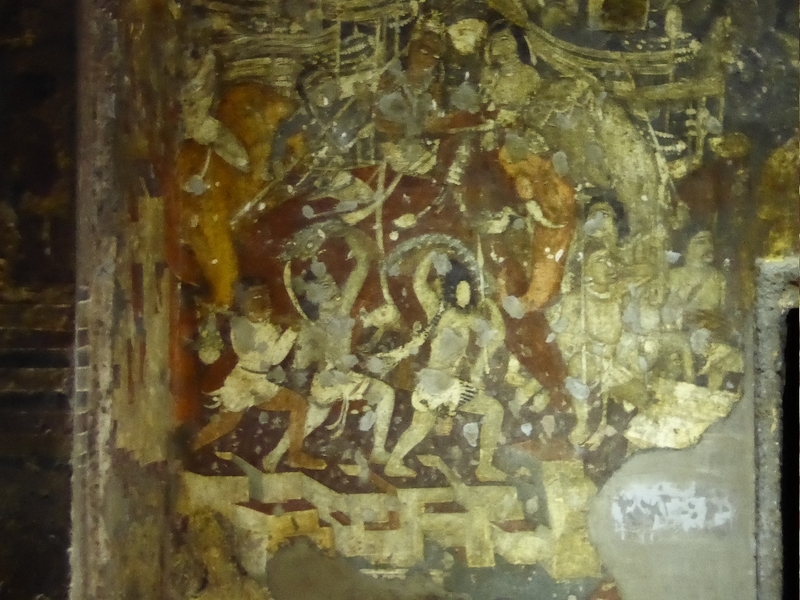 Alternatively it may illustrate the Udayin and Gupta story, where Udayin, son of a priest, is enjoying a last moment of pleasure with Gupta, a widow who was married to Udayin's friend. Udayin is about to renounce worldly pleasure, leaving Gupta to sit disconsolate in her garden. 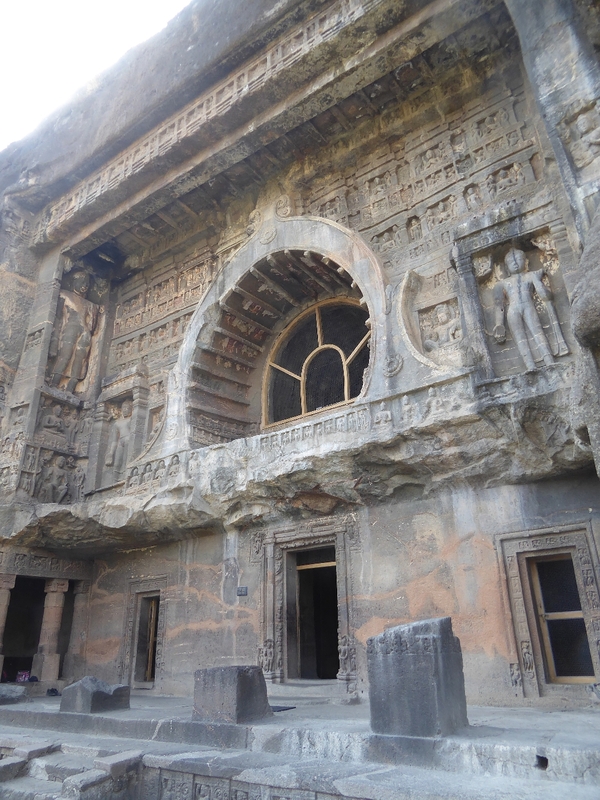 (See Dieter Schlingloff, Guide to Ajanta Paintings, Delhi, 1999, Volume 1, pp. 39-40). 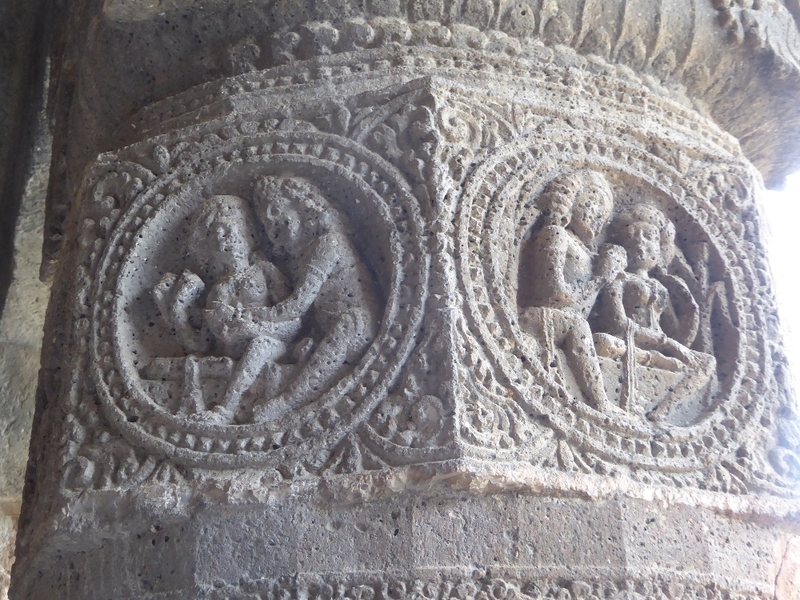 The servant at the right is taken from his dress to be Persian (more specifically, Sassanian), a nice reminder that Fifth Century India was not hermetically sealed off from the wider world. 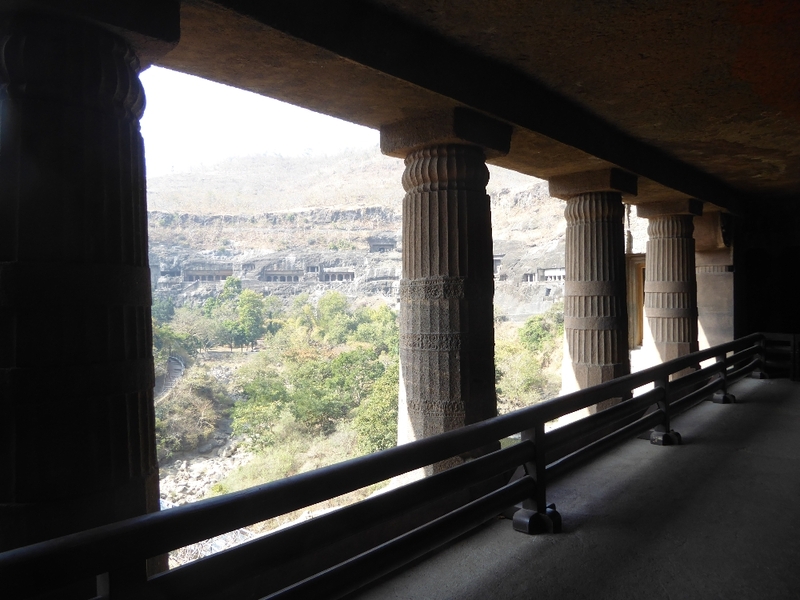 On top of a painting on a column in Cave 10, here's the famous graffito marking the first European in modern times to see Ajanta. It reads: "John Smith, 28th Cavalry, 28th April, 1819." Two hundred years later, precisely: 2019. You won't want for company. 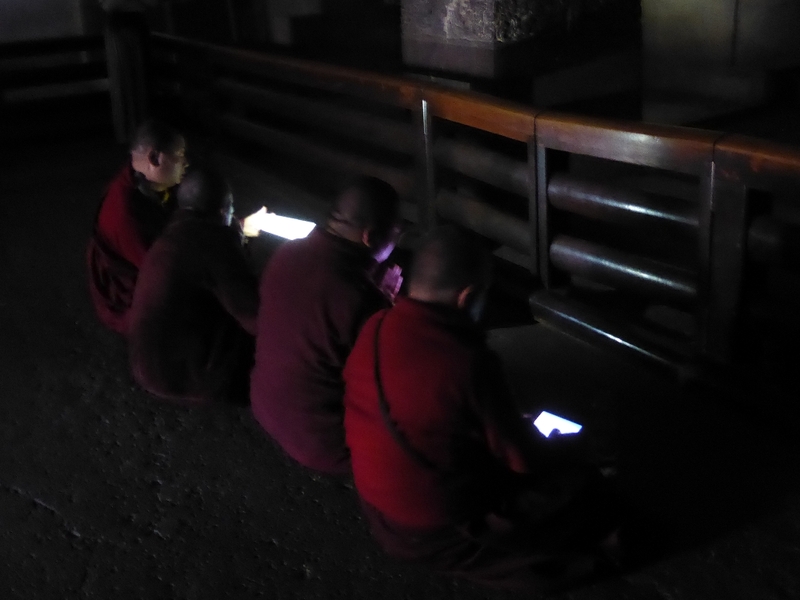 Modern monks manage to ignore the crowds and pray with a little help from iPads.